At one time or another, most people will experience a fall during their lifetime. Most of the time, these are relatively minor events, but they can be disabling or even deadly. 60% off all injuries from falls are from 10' or less. The average fall results in 31 lost workdays. 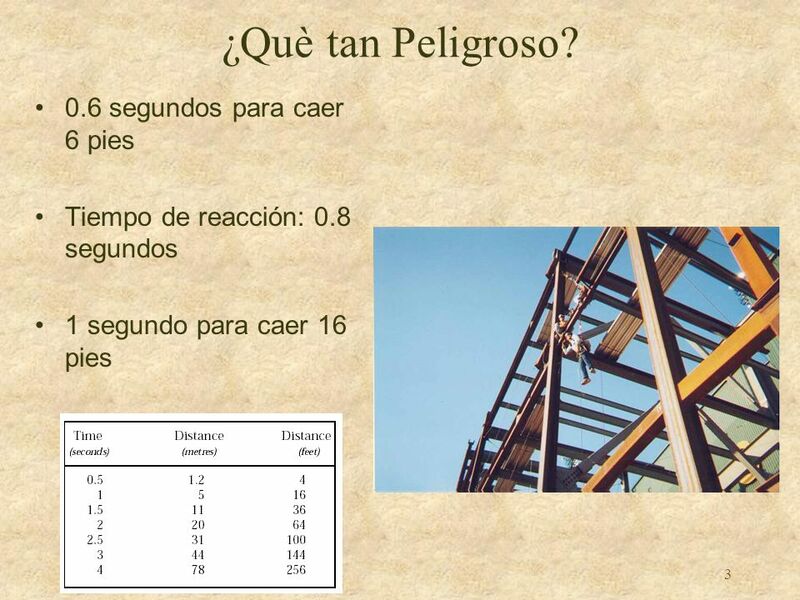 Tiempo de reacción: 0.8 segundos 1 segundo para caer 16 pies Many workers think that they will catch themselves if they fall. Did realize that in 0.6 seconds you will fall 6 feet? According to defensive driving experts, normal reaction time is 0.8 seconds. Can you react in time to save yourself? If you fall, before you have time to react you will have fallen 6 feet! In the span of only 1 second you will fall a total of 16 feet. You will reach speeds of up to 14 miles per hour when falling 6 feet! At 50 mph you have only a 50% survival rate. 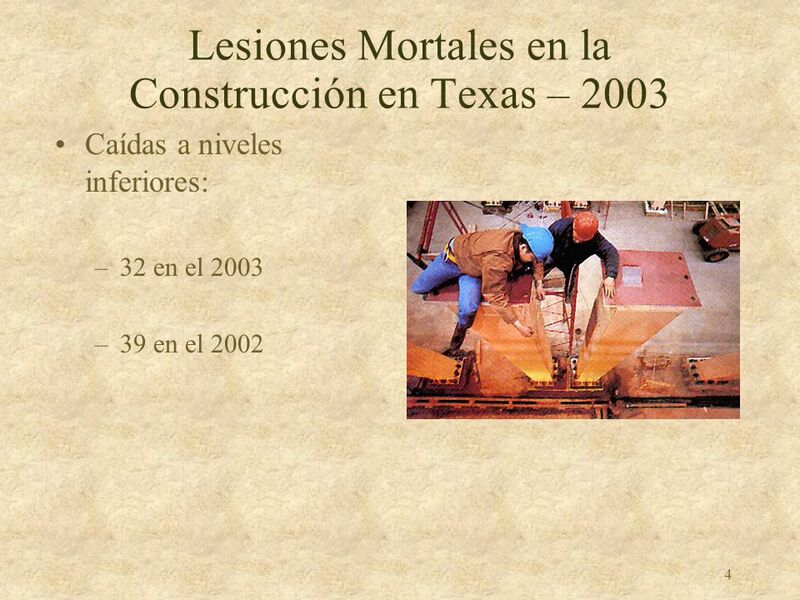 Caídas a niveles inferiores: 32 en el 2003 39 en el 2002 Construction fatalities have begun to fall in the state of Texas. There were 120 in 1999 as opposed to 143 in Of these 51 were falls to a lower level as opposed to 57 in These are encouraging figures but we still have work to do. If we become complacent, the numbers will begin to increase again. 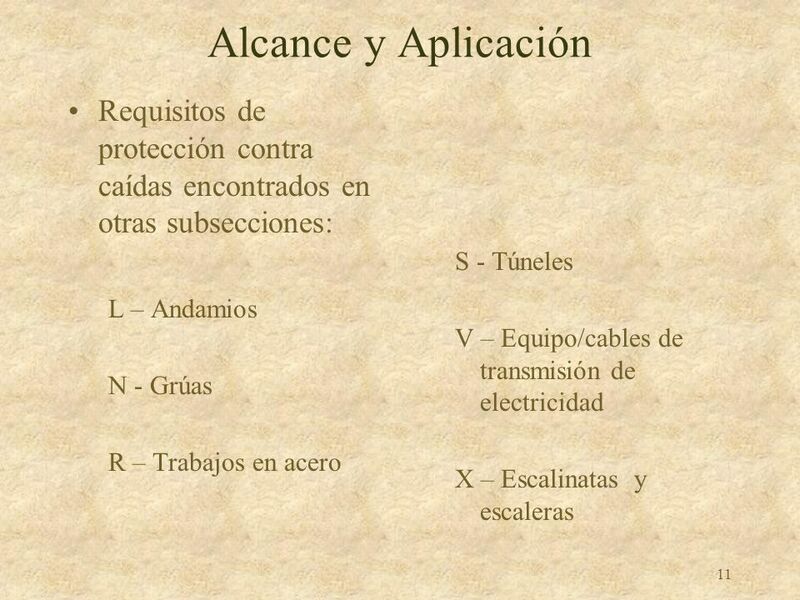 10 Alcance y Aplicación Estipula los requisitos de protección contra caídas en lugares de construcción Excepciones – antes de comenzar o después de terminar la construcción Inspección Investigación Evaluación CFR Scope, Application, and Definitions This section states the scope of Code of Federal Regulation (CFR) and .501, dated February 6, 1995, basically the requirements and criteria for fall protection in construction workplaces. Exception: The provisions of this subpart do not apply when employees are making an inspection, investigation, or assessment of workplace conditions prior to the actual start of construction work or after all construction work has been completed. 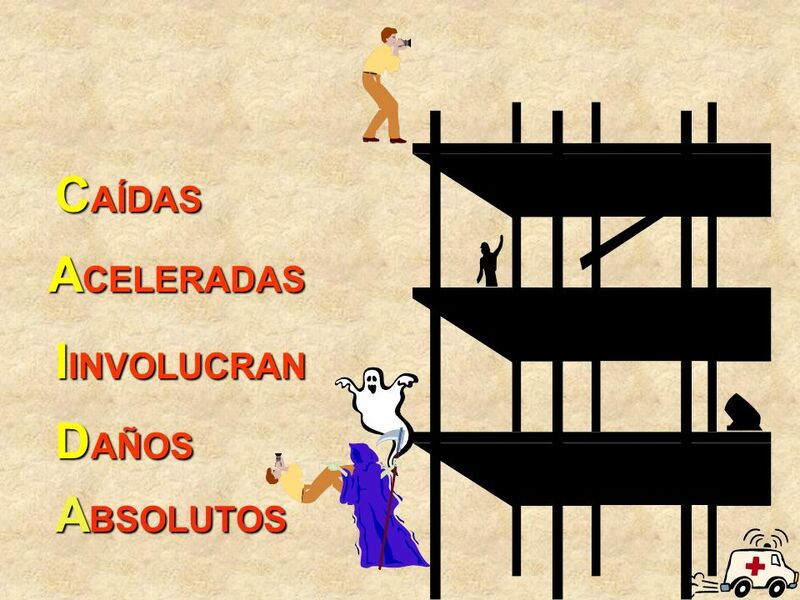 So, to whom does fall protection apply? Today we will be discussing OSHA's Fall Protection Standard for the Construction Industry, but there are instances in which the standard will apply to the general industry. 1. If construction work (surface preparation or sandblasting) is taking place at the same time as maintenance activities (painting), then this Fall Protection Standard will apply to all activities. 2. On the other hand, when these activities are conducted as general maintenance, then the standard would not apply. Fall Protection Systems Criteria and Practices What is a Fall Protection System? A fall protection system is a set of integrated operating procedures and equipment components that protect workers from fall hazards. Most fall protection systems serve one of two basic functions: l. they prevent (restrain) a worker from falling, or 2. they safely stop (arrest) a worker who experiences a fall. 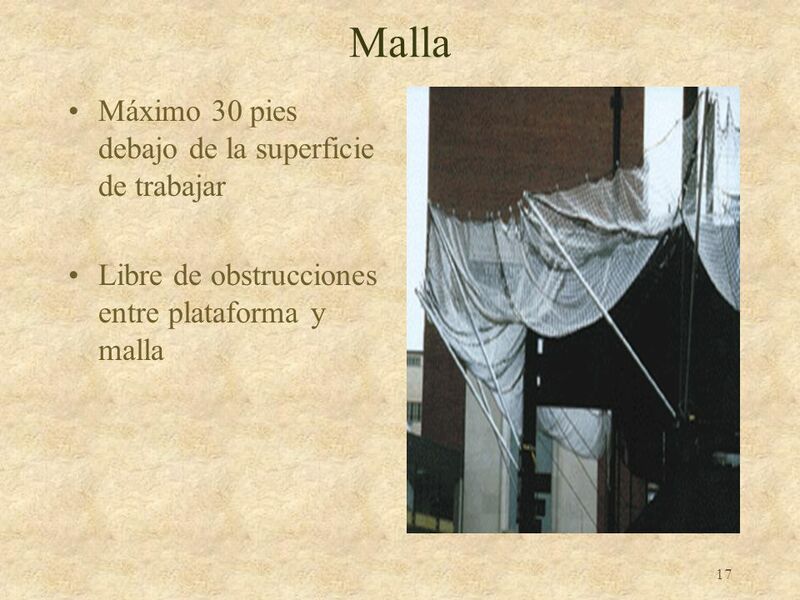 Libre de obstrucciones entre plataforma y malla Safety net systems are conventional fall arrest systems consisting of mesh nets, including panels, connectors and other impact‑absorbing components. 1. Criteria and Performance Requirements for Safety Net Systems a. Vertical distance from the working surface: Safety net systems must be installed as close as possible below the surface on which persons are working; but in no case, more than 30 feet below the working surface. When nets are used on bridges, the potential fall area from the working surface to the net must be free from obstructions. b. Horizontal distance from the working surface: The minimum horizontal distance the outer edge of a safety net must extend from the edge of a working surface depends on the net's vertical distance below the surface. c. Safety nets must be drop tested at the job site after initial installation, relocation, repair, and at six‑month intervals if they are left in one place. The drop test consists of a 400 pound bag of sand 30 inches in diameter (plus or minus two inches) dropped to the nets from surfaces from which workers could fall. Defective nets and components must be removed from service. 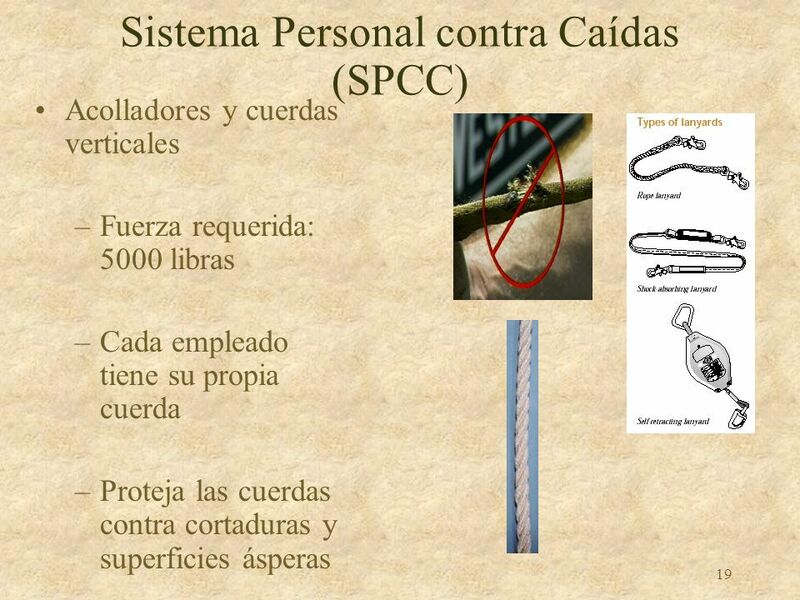 Acolladores y cuerdas verticales Fuerza requerida: 5000 libras Cada empleado tiene su propia cuerda Proteja las cuerdas contra cortaduras y superficies ásperas Lanyards & vertical lifelines must have a breaking point of 5000 pounds. 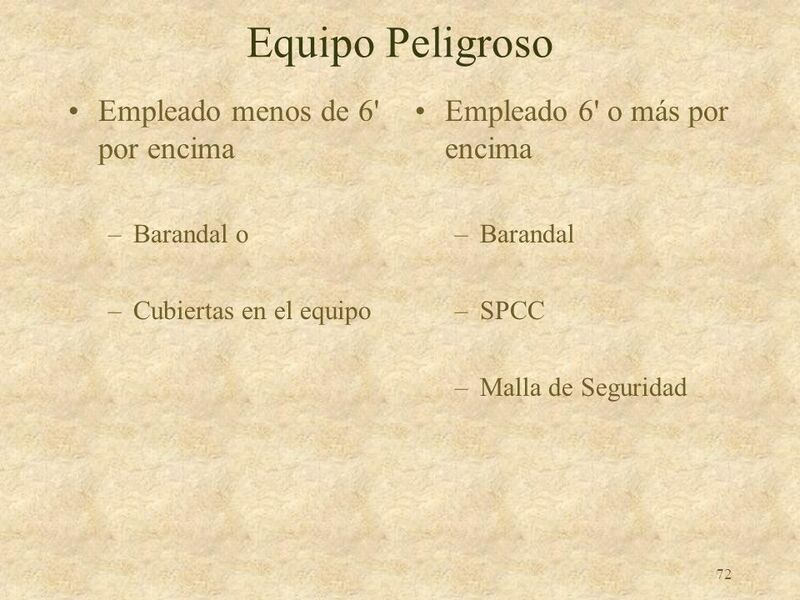 Each employee is required to have a separate lifeline while working. Ensure that you protect lifelines against cuts and abrasions to avoid frayed lines which could potentially break. 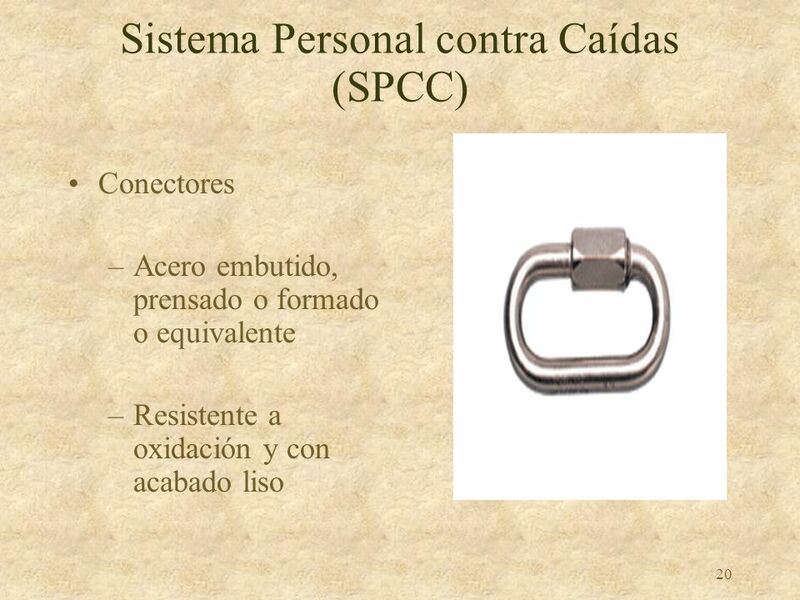 Conectores Acero embutido, prensado o formado o equivalente Resistente a oxidación y con acabado liso Connectors must be drop forged, pressed or formed steel or equivalent materials. They must also be corrosion resistant and smooth finish. 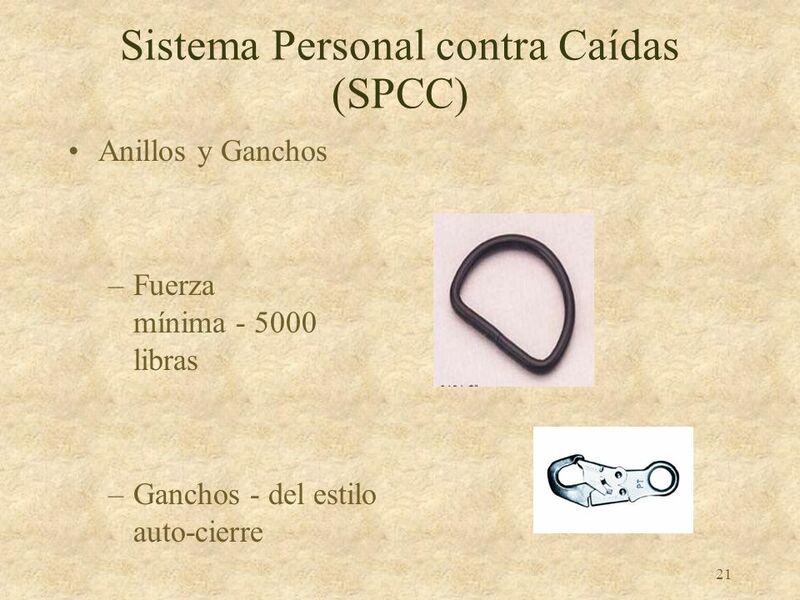 Anillos y Ganchos Fuerza mínima ‑ 5000 libras Ganchos ‑ del estilo auto-cierre Dee Rings and snaphooks must have a minimum breaking strength of 5000 lbs. Snaphooks must be of the locking type to prevent slippage of the lifeline. 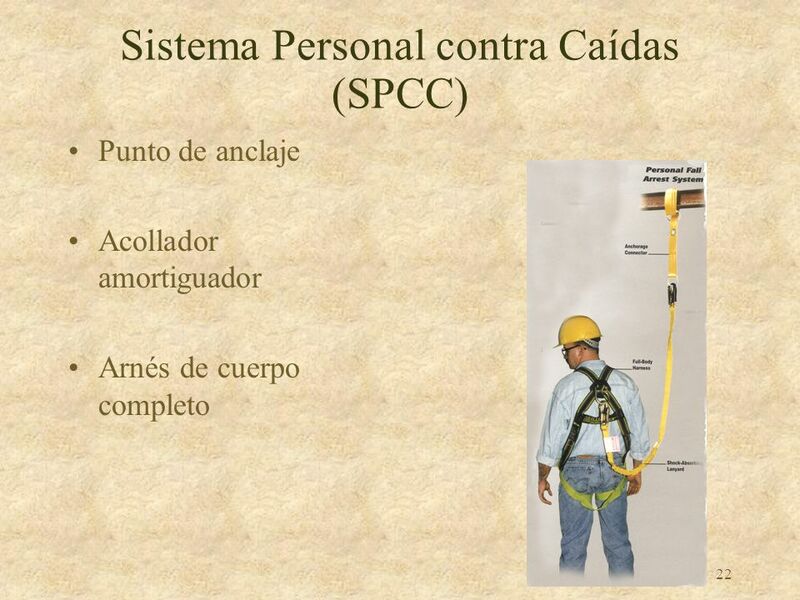 Punto de anclaje Acollador amortiguador Arnés de cuerpo completo A personal fall arrest system consists of the following: a. Tie‑off point which must withstand 5000 pounds of force for each worker. This point should be at or above the dee ring. b. Shock‑absorbing lanyard arrests the fall to 830 pounds and limits the fall to 6 feet. c. Cross arm strap maintains stability of the equipment. d. Full‑body harness helps distribute the forces of the fall evenly over the body. 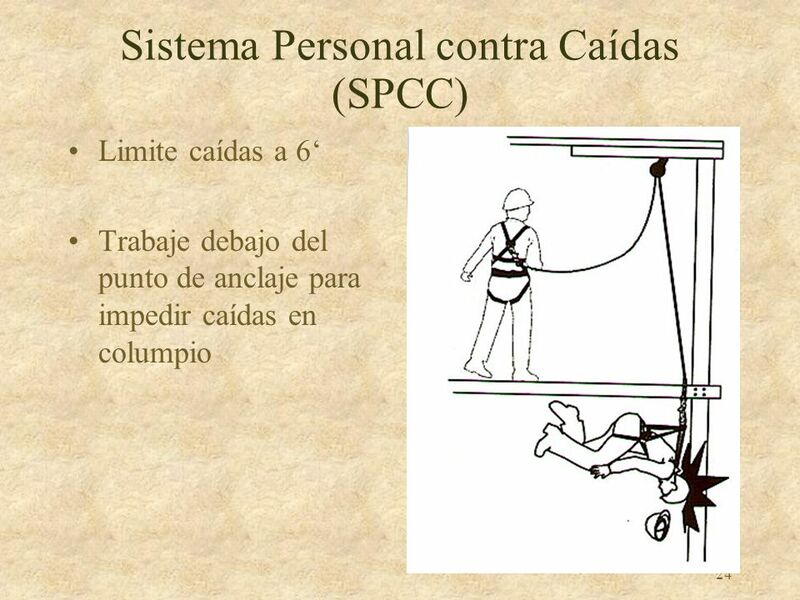 Limite caídas a 6‘ Trabaje debajo del punto de anclaje para impedir caídas en columpio Personal fall arrest systems must limit a worker's free‑fall distance to six feet without contacting a lower level. Always work directly below the anchorage point to avoid a swing fall. 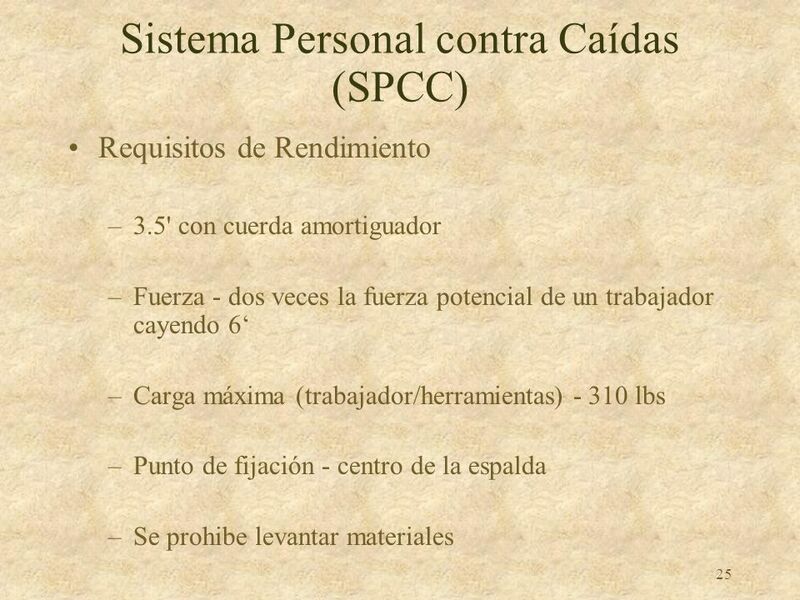 Requisitos de Rendimiento 3.5' con cuerda amortiguador Fuerza ‑ dos veces la fuerza potencial de un trabajador cayendo 6‘ Carga máxima (trabajador/herramientas) ‑ 310 lbs Punto de fijación ‑ centro de la espalda Se prohibe levantar materiales Criteria and Performance Requirements a. Must completely stop a free‑fall and limit deceleration distance to 3.5 feet with a shock‑absorbing lanyard with a force limit of 900 lbs. b. 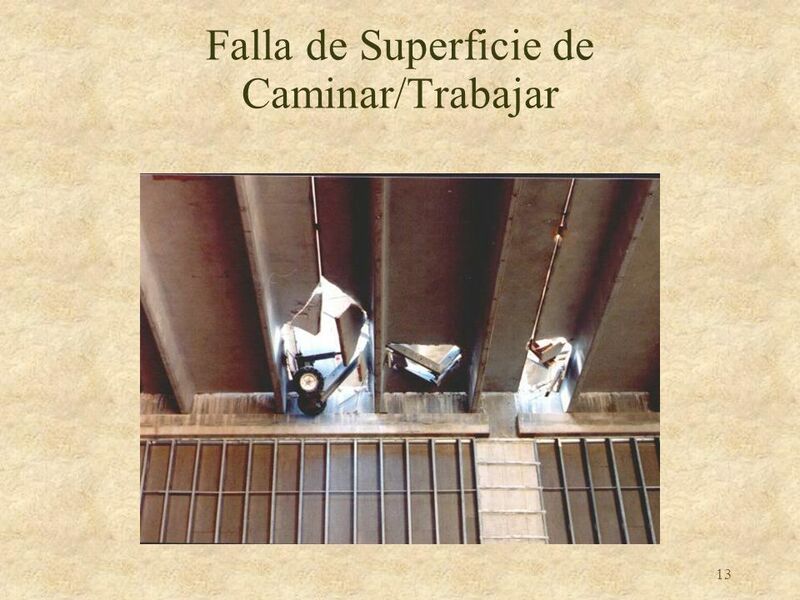 Must have sufficient strength to withstand twice the potential loading force of a worker free‑falling six feet, or the free‑fall distance permitted by the system, whichever is less. c. If the combined tool and person weight of a personal fall arrest system exceeds 310 pounds, employers must adjust the criteria of Subpart M Appendix C to account for the heavier weight. This must be left to the manufacturer to design. d. Attachment point to body belt or harness: The attachment point to a body belt must be located in the center of the wearer's back. The attachment point to a body harness must be located in center of the wearer's back near shoulder level or above the wearer's head. 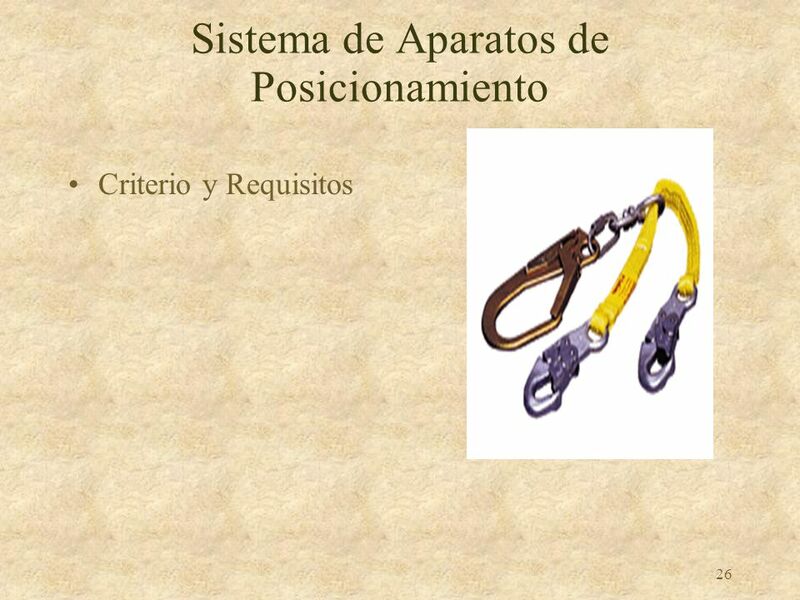 e. Hoisting prohibitions: body belts, harnesses, and other components must be used only for personal fall protection and not to hoist materials. 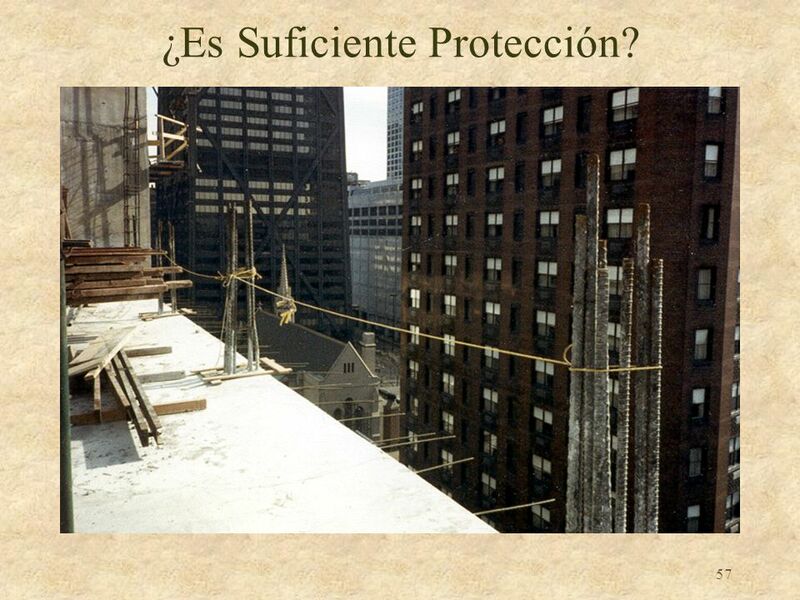 Criterio y Requisitos These fall protection systems enable a person to work with both hands free on a surface such as a wall or other vertical structure. 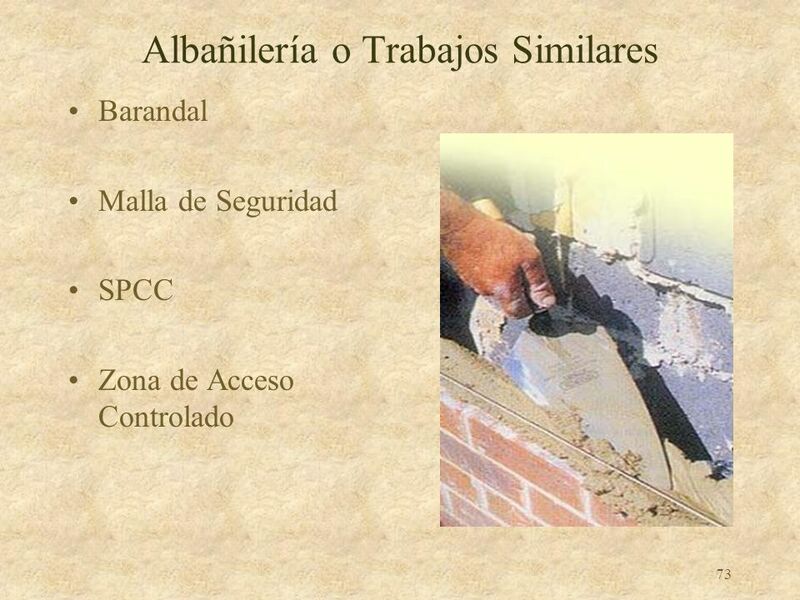 They are typically used in form work and concrete rebar placement. The primary difference between a positioning device system and a personal fall arrest system is that a positioning device system supports a worker on an elevated surface and limits a fall to two feet. They are not considered PFAS. 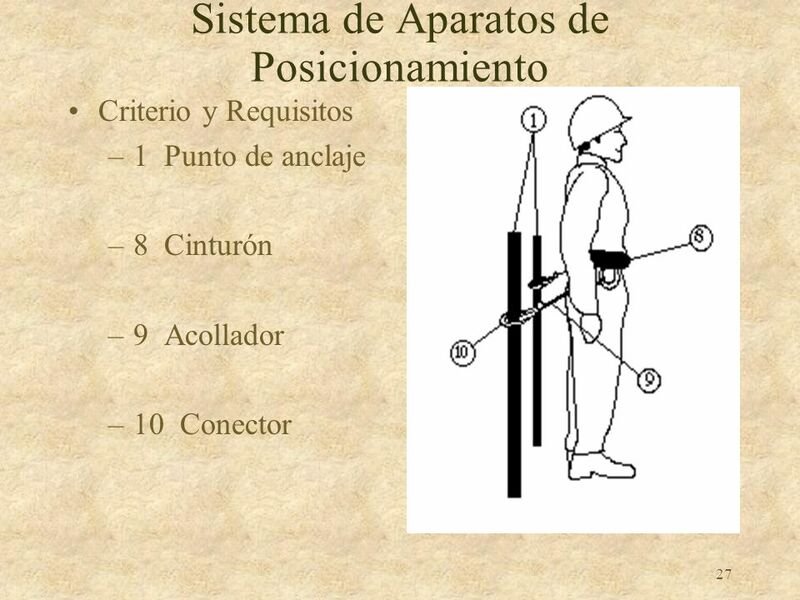 Criterio y Requisitos 1 Punto de anclaje 8 Cinturón 9 Acollador 10 Conector Criteria and Performance Requirements for Positioning Device Systems a. Free‑fall distance: Positioning device systems must be rigged so that a worker cannot free‑fall more than two feet. b. Anchorage: Positioning device systems must be secured to an anchorage capable of supporting at least twice the maximum potential arresting force load of a worker's fall or 3,000 pounds, whichever is greater. 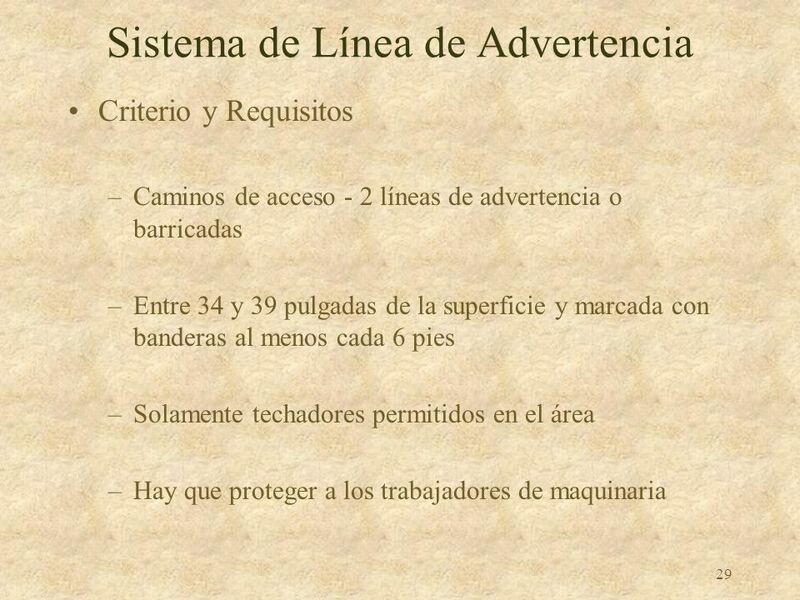 Sogas, alambres o cadenas y estacas Manera de usar: Ningún equipo mecánico ‑ al menos 6' del borde Equipo mecánico ‑ 10' del borde Warning line systems consist of ropes, wires, or chains and supporting stanchions that form a barrier to warn workers they are near an unprotected roof side or edge. Warning line systems mark off an area within which persons may do roofing work without using guardrails, body belts or safety nets. 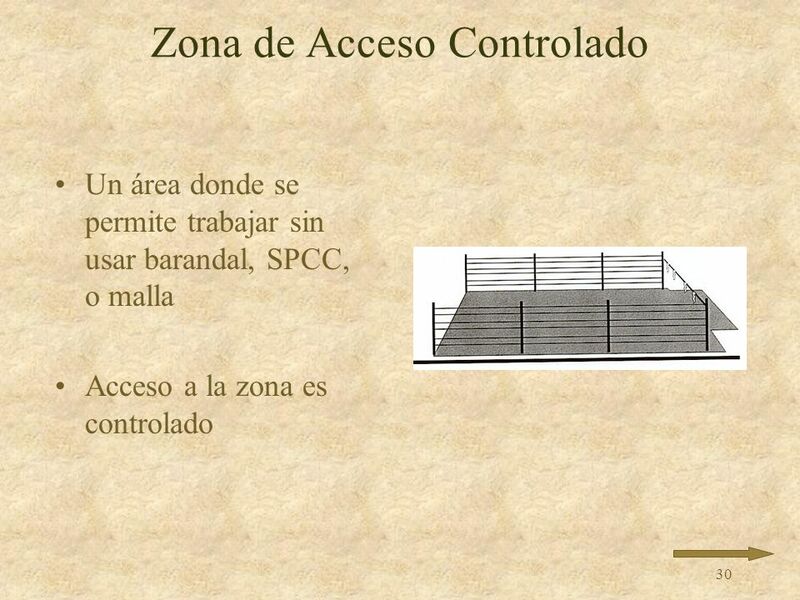 Un área donde se permite trabajar sin usar barandal, SPCC, o malla Acceso a la zona es controlado A controlled access zone is an area in which certain work may take place without use of guardrail, personal fall arrest or safety net. 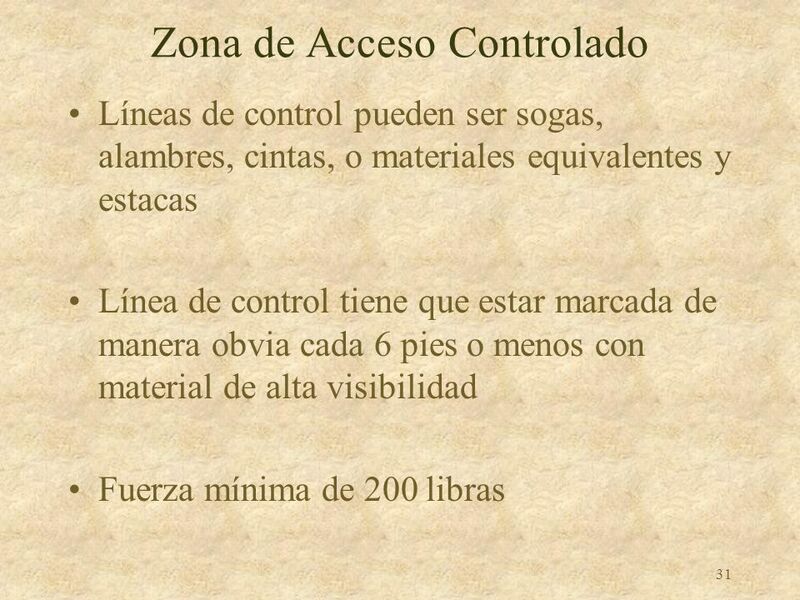 Access to the zone is controlled. 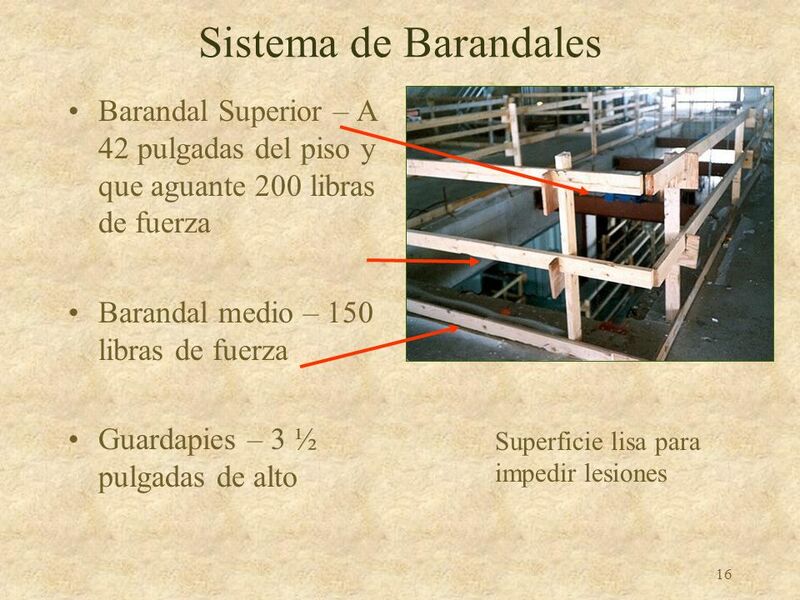 Líneas de control pueden ser sogas, alambres, cintas, o materiales equivalentes y estacas Línea de control tiene que estar marcada de manera obvia cada 6 pies o menos con material de alta visibilidad Fuerza mínima de 200 libras 1. Controlled access zone is an area within which persons can do work under a fall protection plan, without using conventional fall protection. 2. A CAZ is formed by erecting a control line or lines that restrict access to the area. 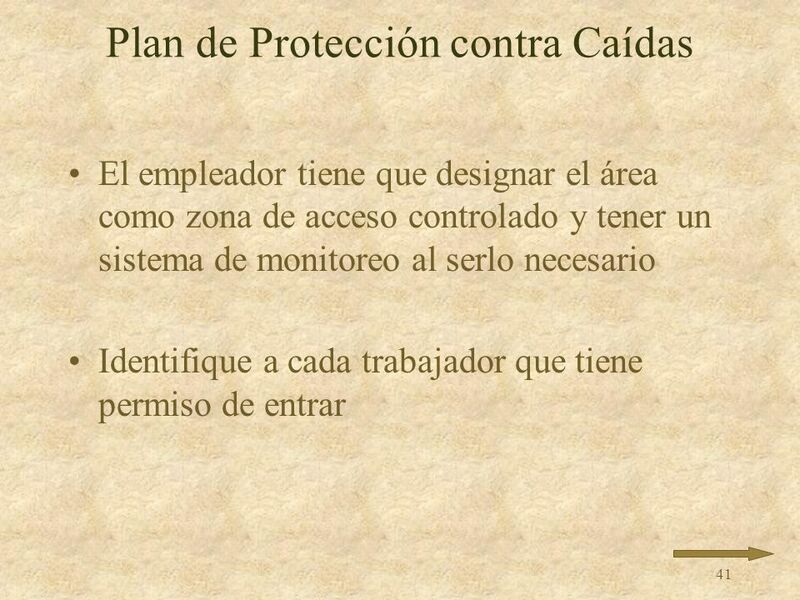 The control line warns personnel that access to the zone is limited to specifically identified workers only. All other persons are prohibited from entering a controlled access zone. 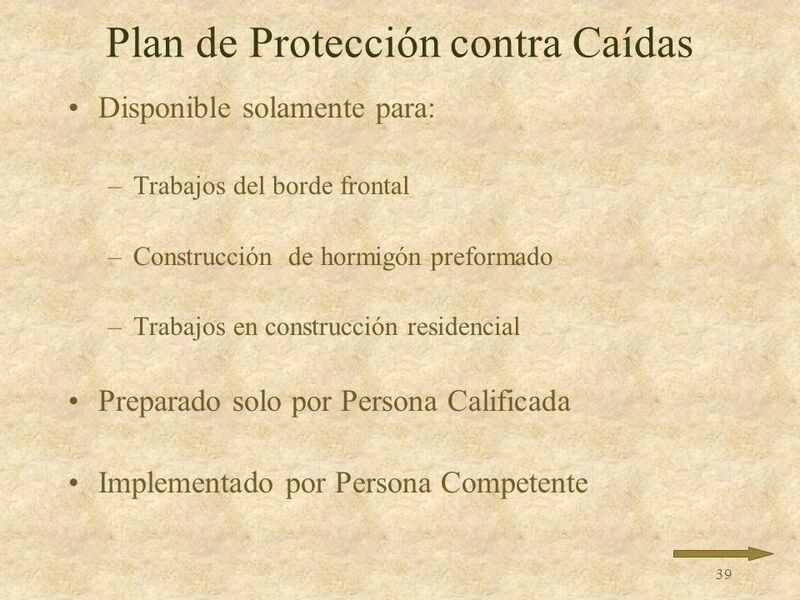 A CAZ must be used with a Fall Protection Plan. 3. 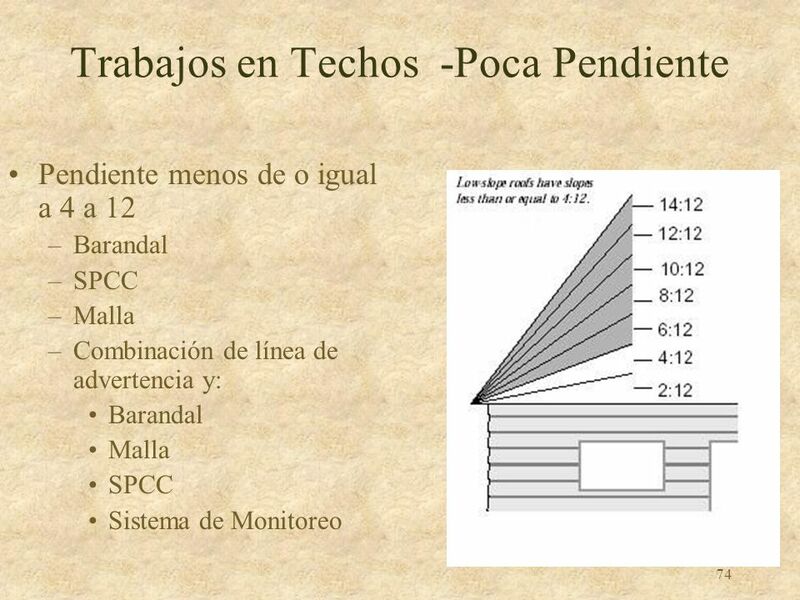 Control lines consist of ropes, wires, tapes, or equivalent materials and supporting stanchions. 4. Control line must be flagged or clearly marked every 6' or less with high visibility material. 5. The established line must have a minimum breaking strength of 200lbs. 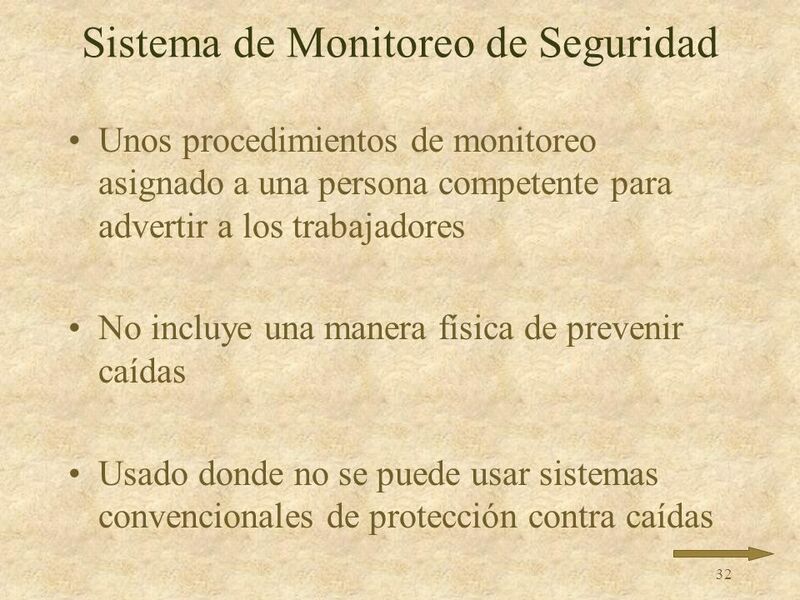 Unos procedimientos de monitoreo asignado a una persona competente para advertir a los trabajadores No incluye una manera física de prevenir caídas Usado donde no se puede usar sistemas convencionales de protección contra caídas A Safety Monitoring System is a set of monitoring procedures assigned to a competent person for warning workers. 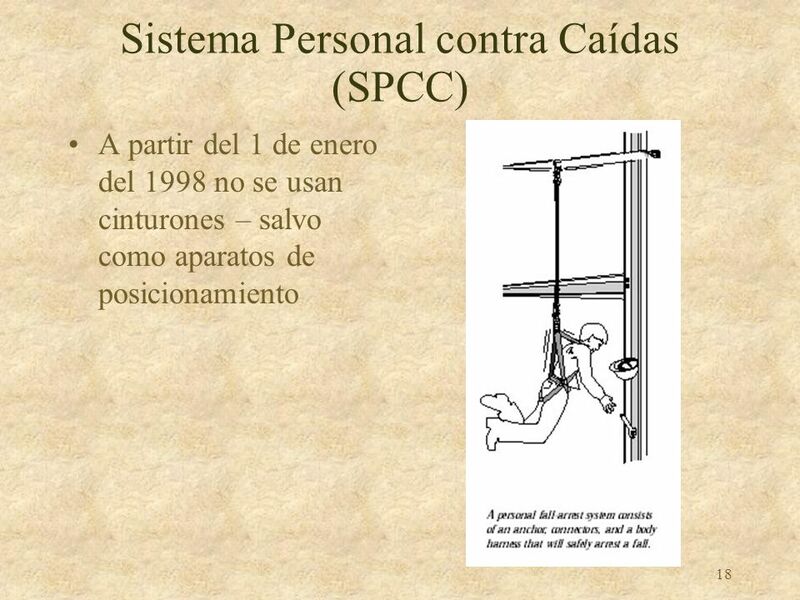 The system does not provide a physical means of preventing or arresting falls and conventional fall protection systems cannot be used. 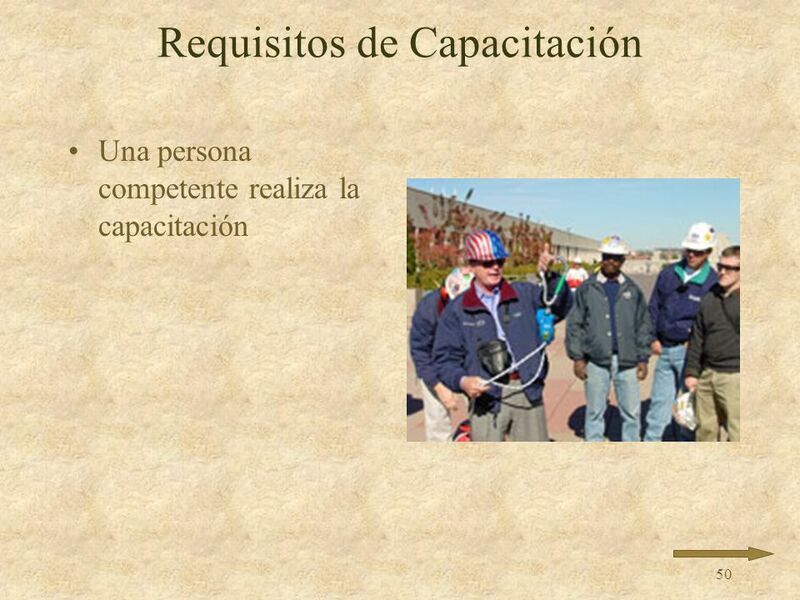 Criterio y Requisitos Persona competente tiene que monitorear Ningún equipo mecánico Solamente ciertos trabajadores permitidos Cada trabajdor tiene que cumplir con las advertencias de peligros de caídas Competent person/Safety monitor: The employer must designate a competent person to monitor the safety of workers exposed to fall hazards in areas defined by safety monitoring systems. a. 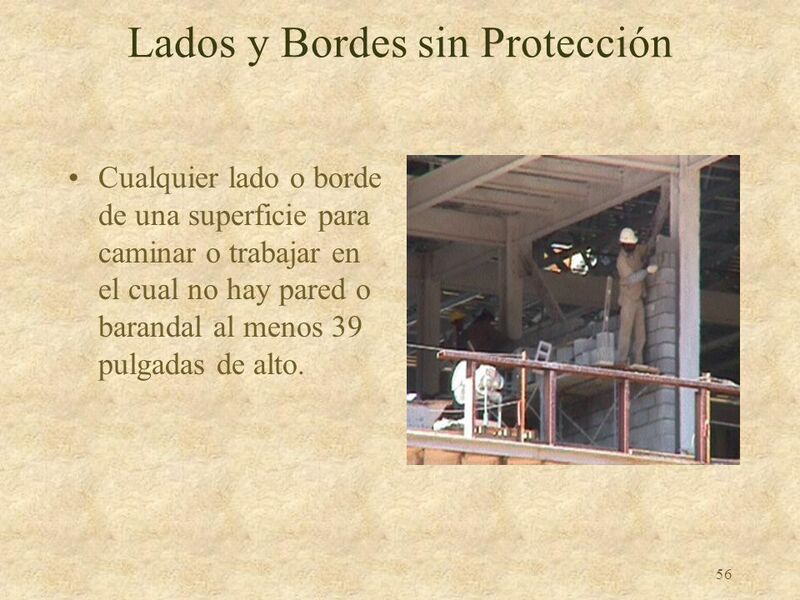 Safety monitors must be on the same surface as the workers they are monitoring; b. See workers at all times; c. Be close enough to verbally warn them of fall hazards; and, d. Not have other duties that could distract them from their monitoring duties. 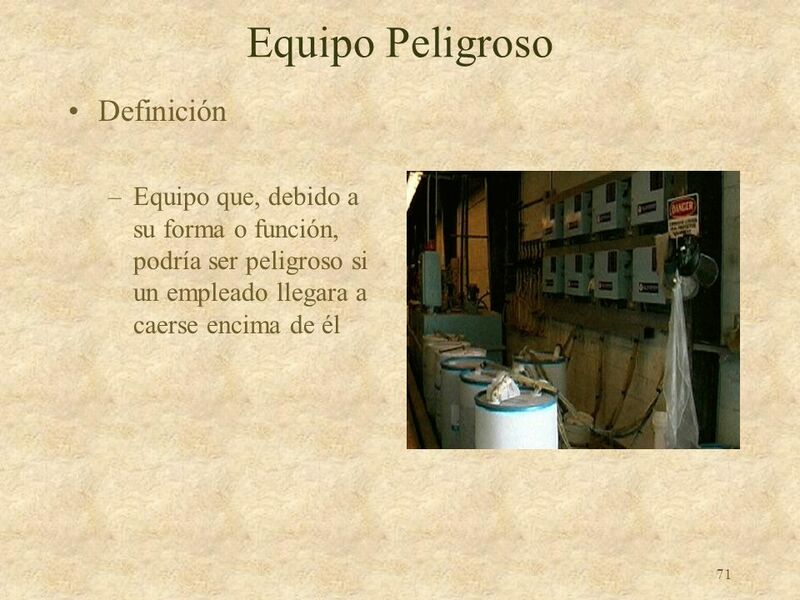 e. Mechanical equipment: Cannot be used or stored in work areas covered by safety monitoring systems. 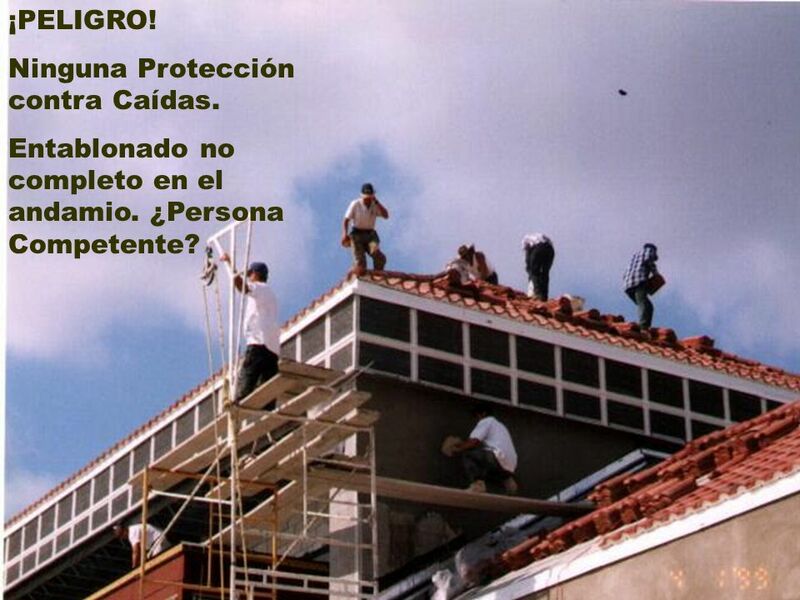 f. Permitted workers: Only persons engaged in roofing work on low‑sloped roofs or covered by a fall protection plan are permitted in areas defined by safety monitoring systems. g. Worker responsibility: Each person working in a controlled access zone must comply promptly with fall hazard warnings issued by safety monitors. 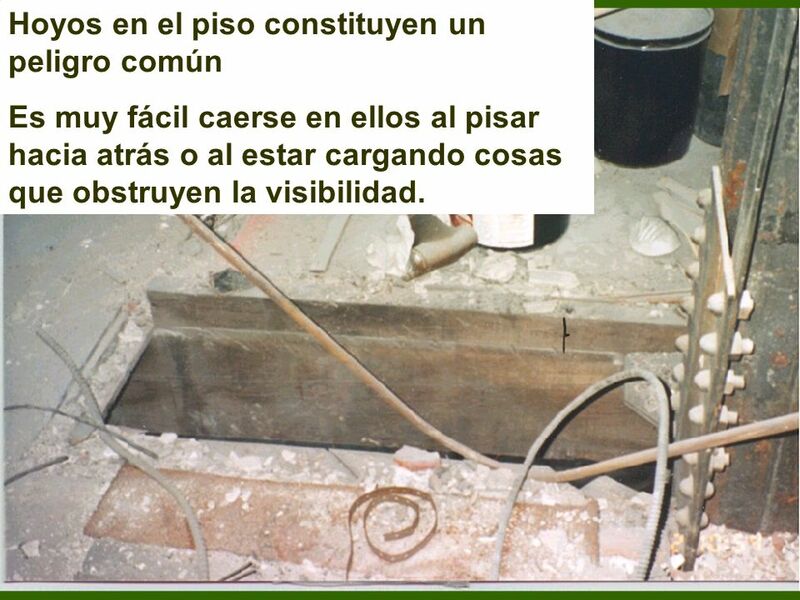 Tienen que estar aseguradas y marcadas Covers - A cover is a rigid object used to overlay openings in floors, roofs, road ways and other walking/working surfaces. 1. Covers must be capable of supporting at least twice the maximum anticipated load of workers, equipment, and materials at any one time, including vehicles which may cross over them. 2. Covers must be secured so that they are not displaced by wind, equipment or workers, and must be color coded or marked with "HOLE" or "COVER". Guardapies Aguantar por lo menos 50 libras de presión Por lo menos 3½ pulgadas de alto Si se acumula material arriba del guardapies, instale malla o equivalente al barandal intermedio Protection from Falling Objects Toeboards - are low protective barriers (3 1/2 inches minimum height) that prevent materials and equipment from falling to lower levels. They must withstand at least 50lbs of pressure and be at least 3 2" tall. 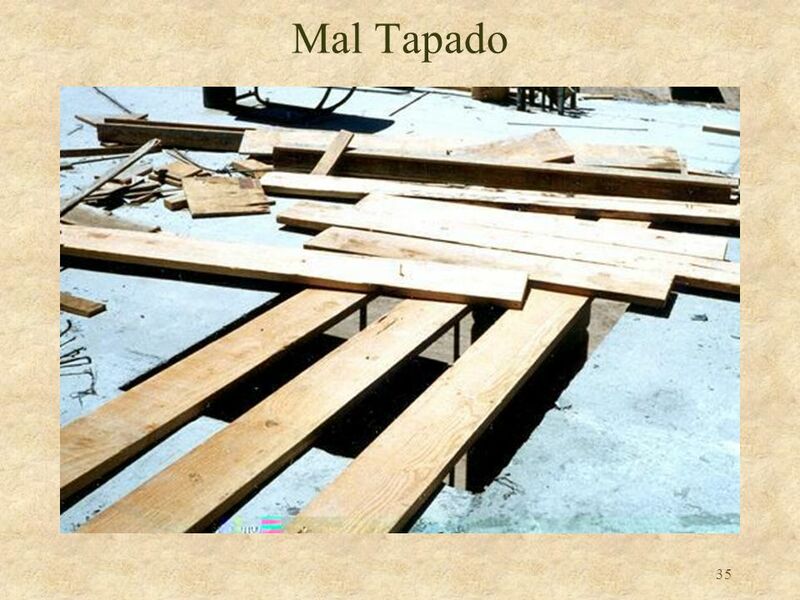 If material is above top edge of toeboard, paneling or screening must extend from the top of the toeboard to the toprail or midrail of guardrail system. 2. Guardrail systems - any opening in a guardrail system intended to protect workers from falling objects must be small enough to prevent objects from passing through. 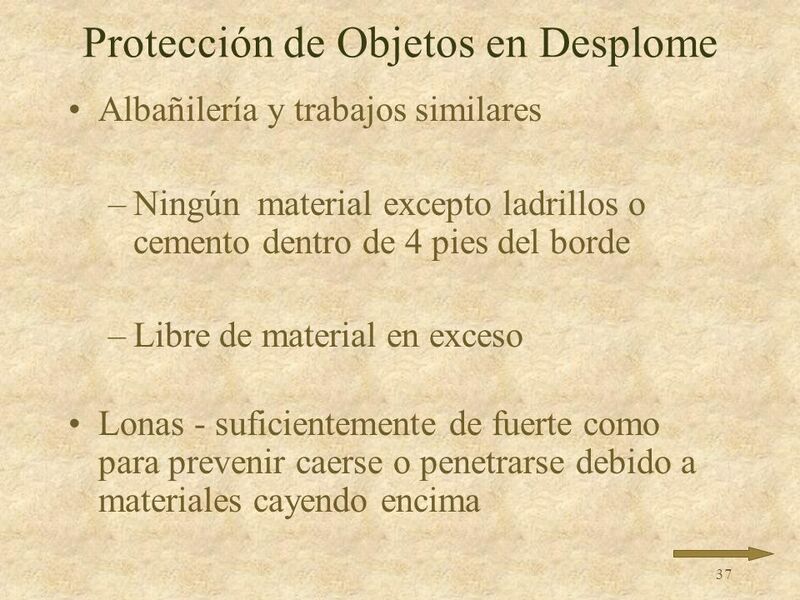 Albañilería y trabajos similares Ningún material excepto ladrillos o cemento dentro de 4 pies del borde Libre de material en exceso Lonas ‑ suficientemente de fuerte como para prevenir caerse o penetrarse debido a materiales cayendo encima 3. 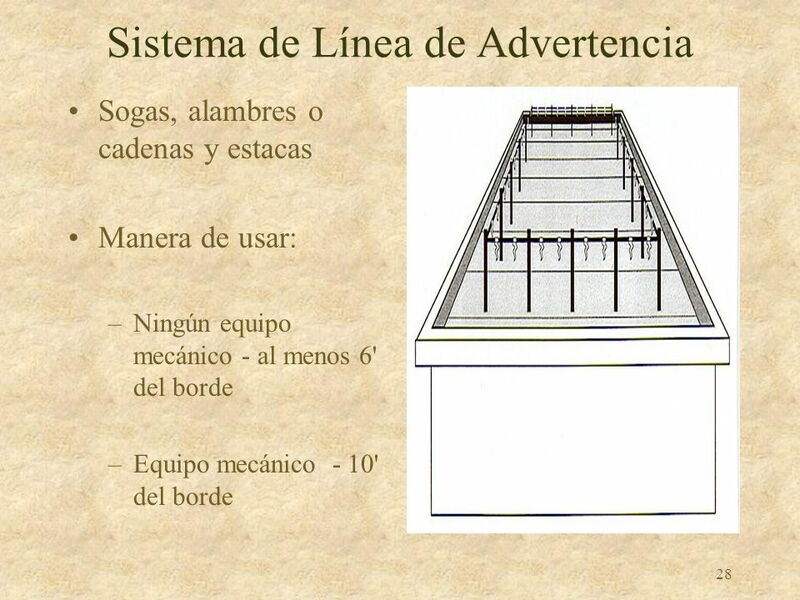 Overhand bricklaying and related work - no materials and equipment except masonry and mortar can be stored within four feet of the working edge. All debris and excess material must cleared from the working edge at regular intervals. Roofing work - materials and equipment must not be stored within six feet of a roof edge unless guardrails are erected at the edge. Materials which are piled, grouped or stacked near a roof edge must be stable and self‑supporting. Canopies - a canopy is cloth or other material suspended over a walking/working surface. Canopies are used primarily to protect workers from falling objects. Canopies must be strong enough to stop objects without collapsing. 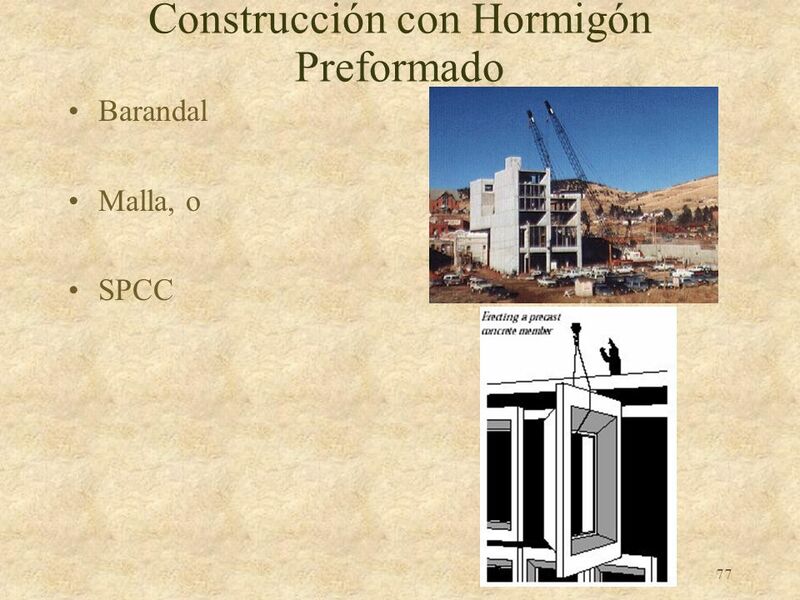 Disponible solamente para: Trabajos del borde frontal Construcción de hormigón preformado Trabajos en construcción residencial Preparado solo por Persona Calificada Implementado por Persona Competente L. Fall Protection Plans - A fall protection plan, correctly written, enables workers doing leading edge work, precast concrete erection work, or residential construction work to use alternative fall protection systems or methods when conventional systems are infeasible. A fall protection plan must be prepared by a qualified person as defined: an individual who has a recognized degree or certificate; extensive knowledge, training, and experience with fall protection systems; and has demonstrated his or her ability to resolve problems. 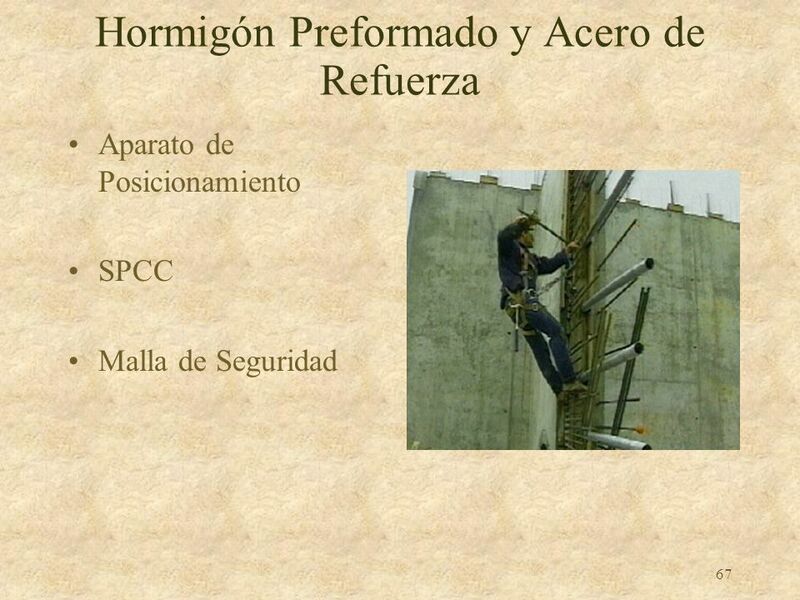 The fall protection plan must be implemented under the supervision of a competent person. 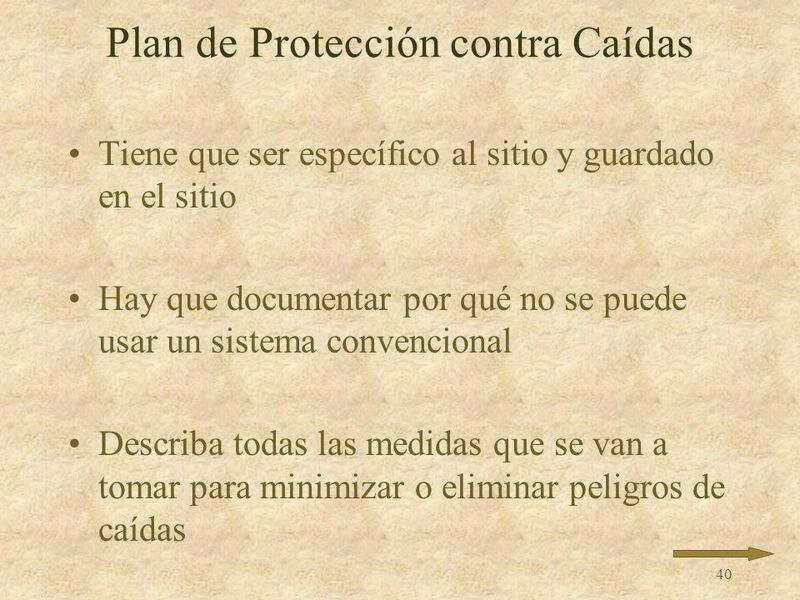 Tiene que ser específico al sitio y guardado en el sitio Hay que documentar por qué no se puede usar un sistema convencional Describa todas las medidas que se van a tomar para minimizar o eliminar peligros de caídas A copy of the fall protection plan, with all approved changes, must be maintained at the job site. The fall protection plan must document why conventional fall protection systems are not feasible or would pose a greater safety hazard to workers than other methods. 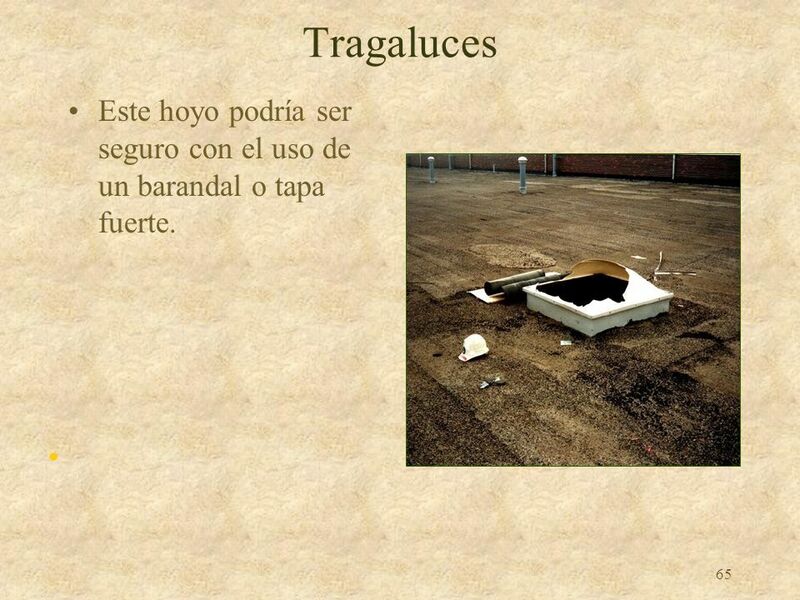 The plan must also document all measures that will be taken to reduce or eliminate the fall hazards. 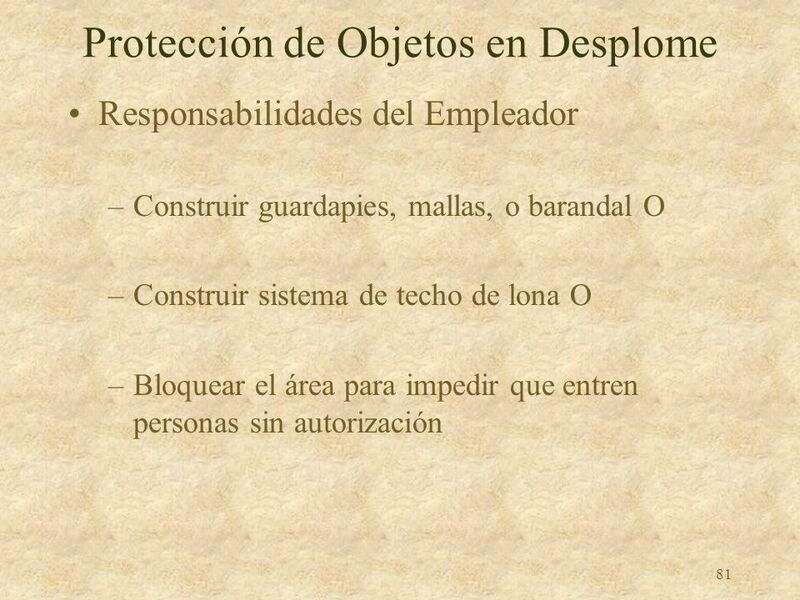 El empleador tiene que designar el área como zona de acceso controlado y tener un sistema de monitoreo al serlo necesario Identifique a cada trabajador que tiene permiso de entrar 5. Controlled access zone requirement: Each location where conventional fall protection methods cannot be used must be classified as a controlled access zone and must satisfy all requirements applicable to controlled access zones. 6. Safety monitoring system requirement: If an alternative fall protection measure is not used in place of a conventional system, the employer must implement a safety monitoring system. 7. Permitted workers: The fall protection plan must identify each person who is designated to work in controlled access zones. No other persons may enter controlled access zones. 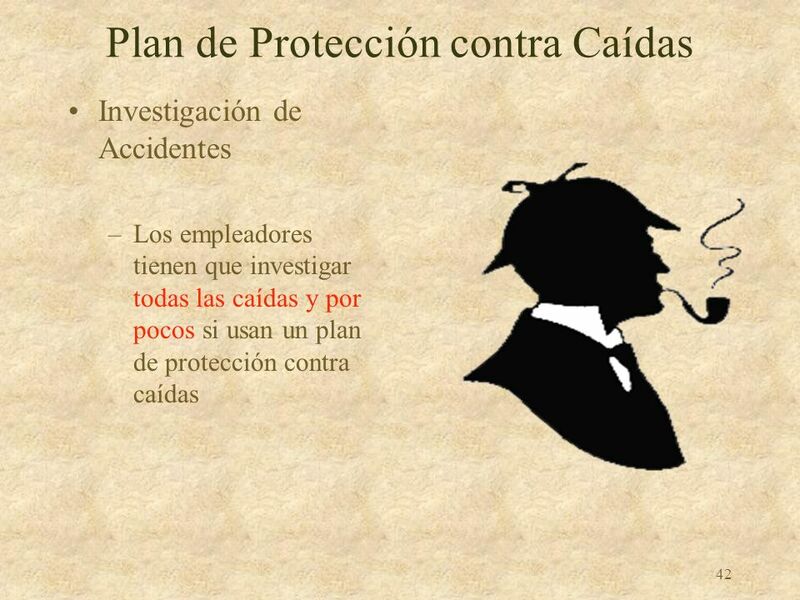 Investigación de Accidentes Los empleadores tienen que investigar todas las caídas y por pocos si usan un plan de protección contra caídas 8. Accident investigation requirement: If a worker covered by a fall protection plan falls or experiences a "near miss" incident, the employer must investigate the event to determine if the plan needs to be modified to prevent such incidents in the future. 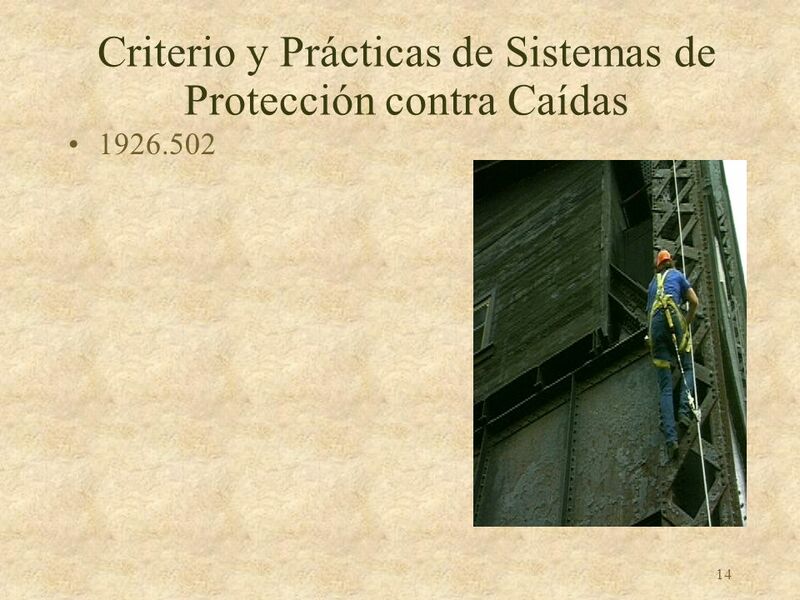 Inspeccionado por una Persona Competente Enseñar a los trabajadores procedimientos correctos de inspección Inspection of Fall Protection Systems Fall protection systems and components do not last forever. Subpart M requires workers who use fall protection systems to inspect them regularly for wear or damage. Subpart M also requires employers to teach workers correct inspection procedures in fall protection training programs. The following steps outline fall protection inspection requirements for workers and employers, good practices for conducting effective inspections, and what to look for during inspections. 1. Systems must be inspected by a Competent Person on a regular basis, prior to each use and after any impact load on the equipment. 2. 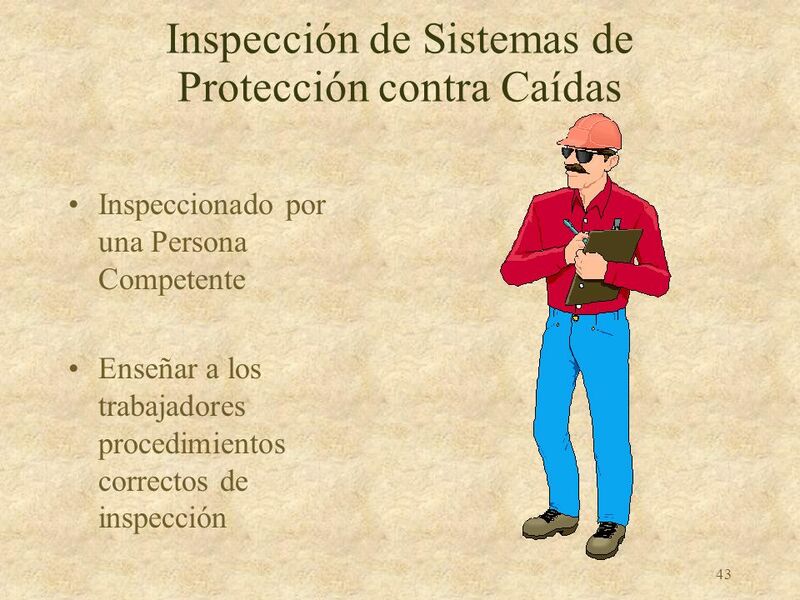 Teach workers correct inspection procedures and ensure they inspect regularly for wear and damage. 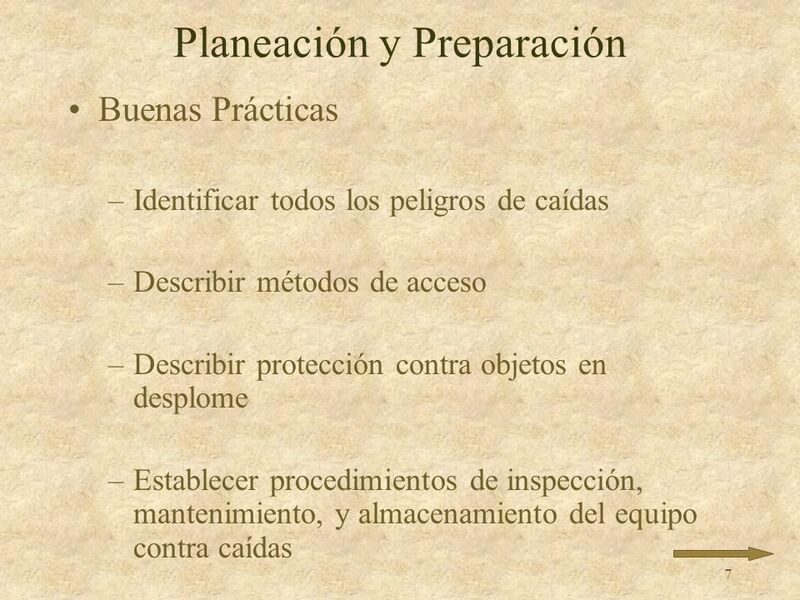 Los procedimientos completamente documentados Identifique al personal médico y de rescate, equipo, comunicaciones, métodos de recuperación y primeros auxilios Preparing for Emergencies Fall protection systems are designed to minimize workers’ exposure to fall hazards and to reduce their risk of injury if they do fall. 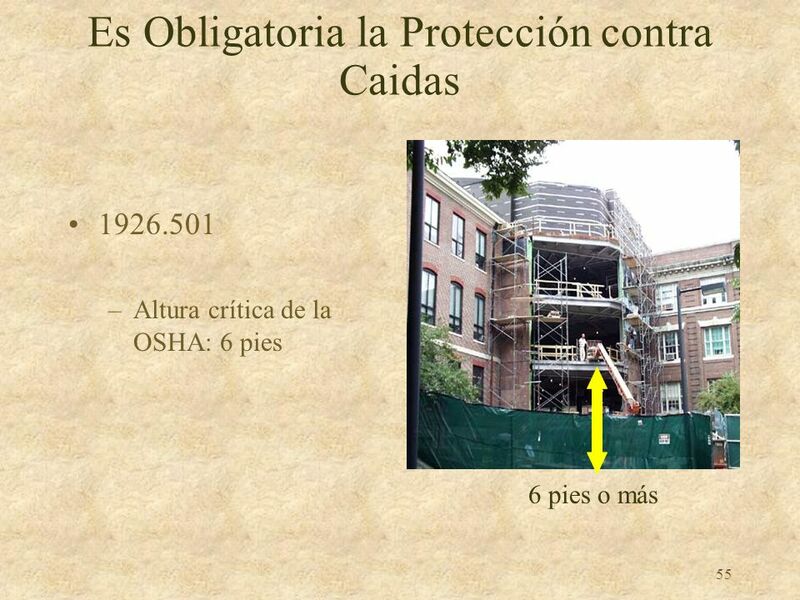 However, no fall protection system comes with a 100 percent worker protection guarantee. Employers must establish procedures to ensure that workers who do fall or injured as the result of a fall receive immediate medical attention. Emergency response procedures should be fully documented through the fall protection planning process before workers install or use any arrest/restraint system. 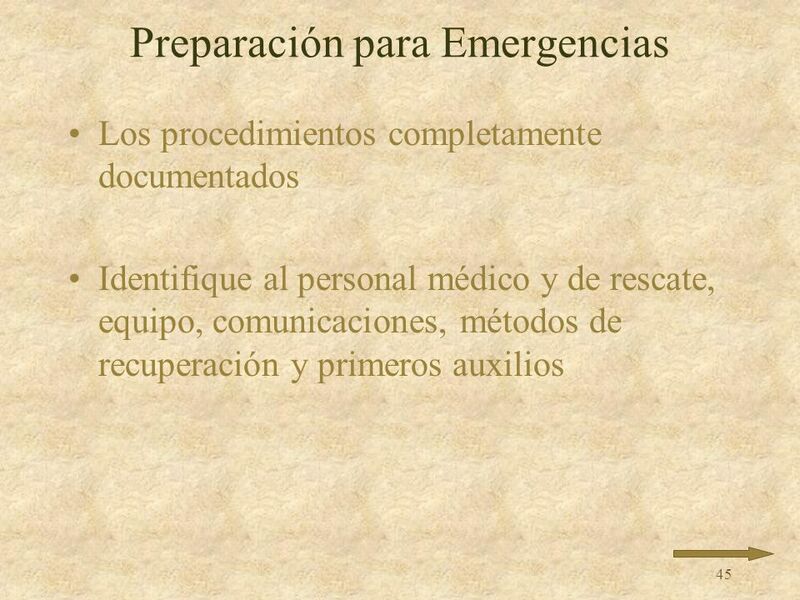 Emergency procedures should identify key rescue and medical personnel, equipment available for rescue, emergency communications procedures, retrieval methods and primary first aid requirements. 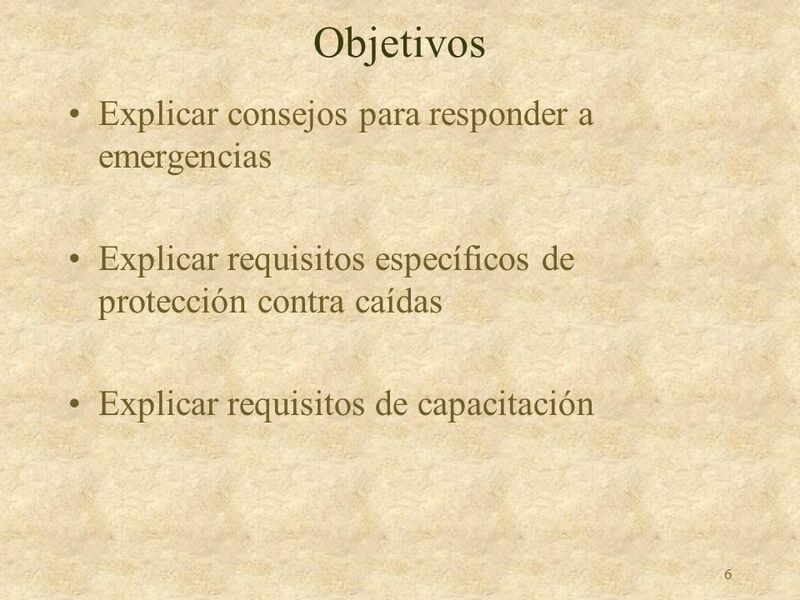 The following list identifies good practice guidelines for developing emergency response planning procedures, responding to emergencies and investigating accidents. 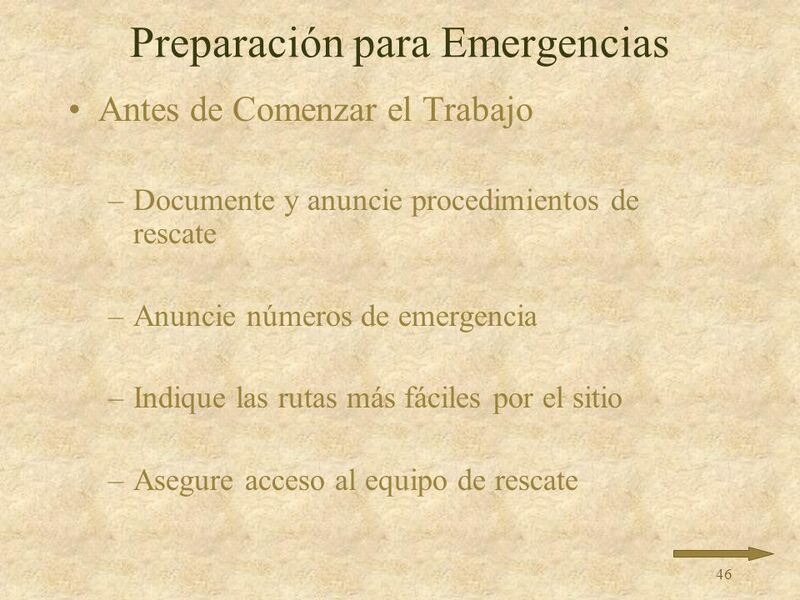 Antes de Comenzar el Trabajo Documente y anuncie procedimientos de rescate Anuncie números de emergencia Indique las rutas más fáciles por el sitio Asegure acceso al equipo de rescate Before on-site work begins: Make fire department or emergency response units aware of the job specifications at the site and any factors that may slow response time. Create one or more joint training sessions between key on‑site personnel and emergency responders. Document the rescue plan and make sure it is posted at the work site. Post emergency responder phone numbers and addresses at the work site. Mark the job site with signs and note the easiest access routes in and out of the site. 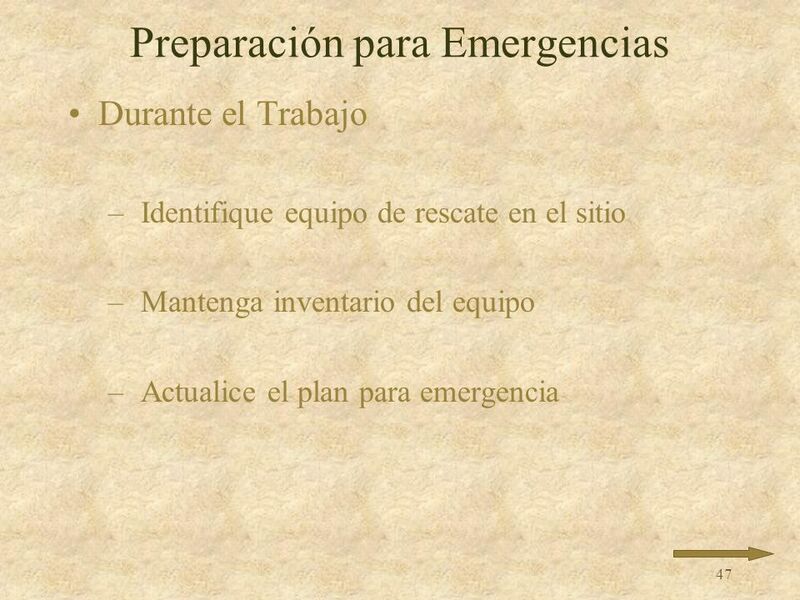 Durante el Trabajo Identifique equipo de rescate en el sitio Mantenga inventario del equipo Actualice el plan para emergencia F. As on‑site work progresses: 1. Identify on‑site equipment that can be used for rescue and retrieval. Maintain a current equipment inventory at the site. Equipment may change frequently as the job progresses. 3. Reevaluate and update the emergency response plan if on‑site work tasks change. 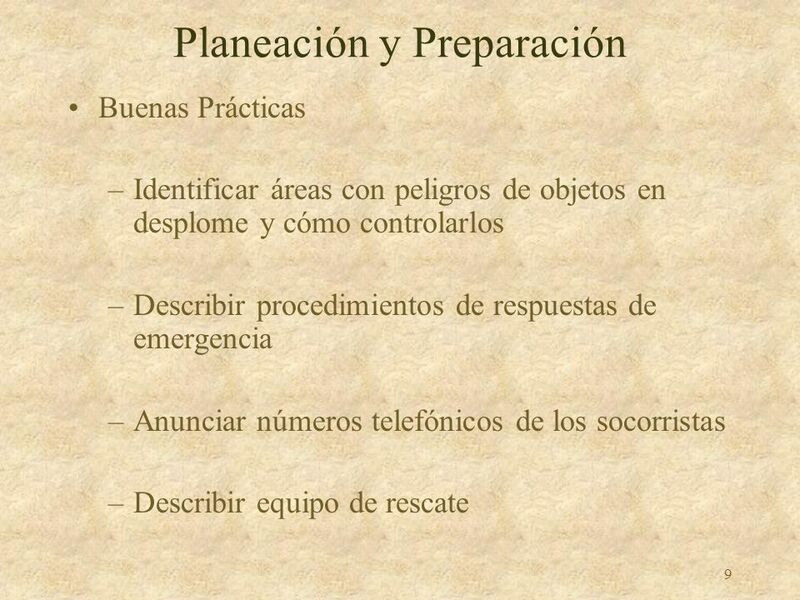 Si ocurre una emergencia Llame al 911 u otros números de emergencia Prepare un camino para la víctima Haga que alguien dirija al personal de emergencia Asegure que solamente personal capacitado intente el rescate Saque a todo personal no esencial Determine la condición de la víctima Controle sangramiento o use RCP si es necesario G. Occurrence of an emergency: 1. 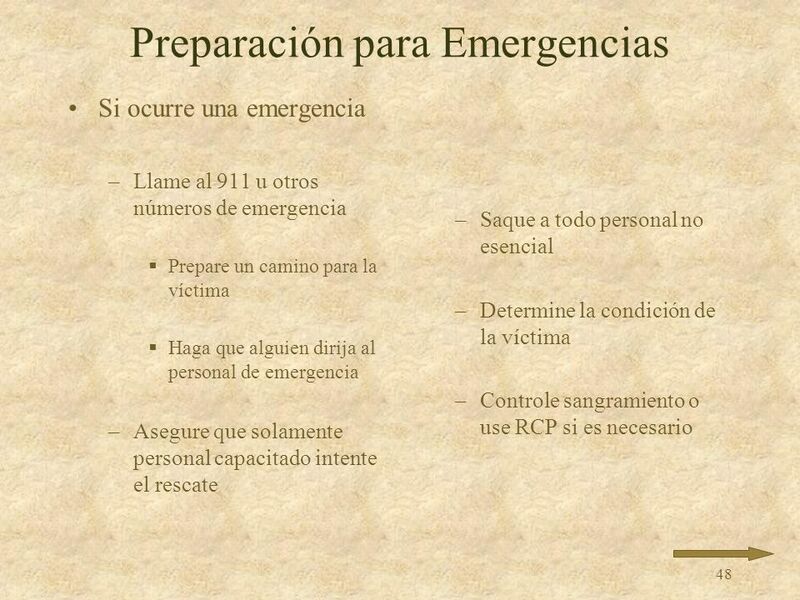 Call 911 or other emergency numbers indicated on the emergency response plan. First responders should clear a path to the victim. Others should be sent to direct emergency personnel to the scene. 2. Make sure only qualified personnel attempt a technical rescue. 3. Prohibit all nonessential personnel from the fall‑rescue site. 4. Talk to the fall victim; determine the victim's condition if possible. 5. If the victim is accessible: make comfortable, check vital signs. If necessary: administer CPR, attempt to stop bleeding. 6. Do not attempt a solo rescue if victim is suspended. Wait for trained emergency responders. 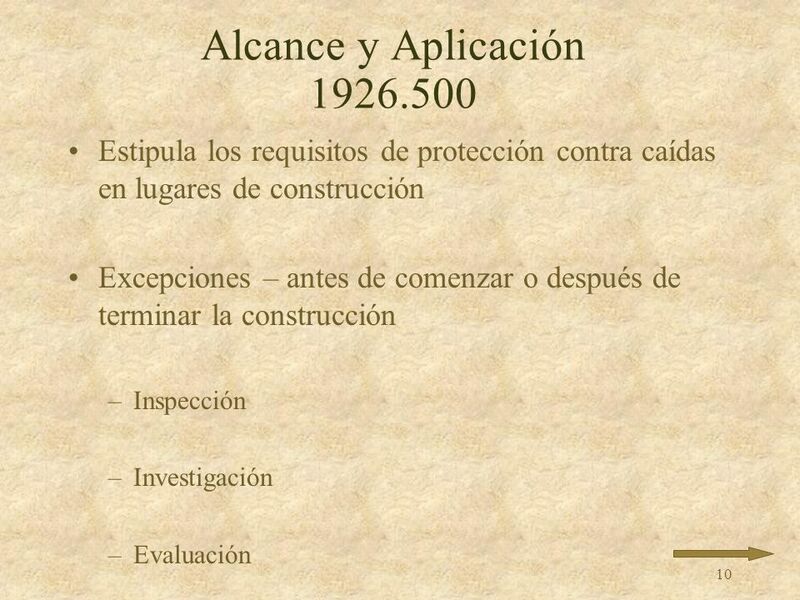 Investigando un Accidente Reporte muertos o lesiones múltiples a la OSHA dentro de 8 horas Identifique equipo relacionado al accidente Documente lo sucedido Repase el plan de protección contra caídas Haga que una persona competente inspeccione el equipo H. Investigating an accident: 1. 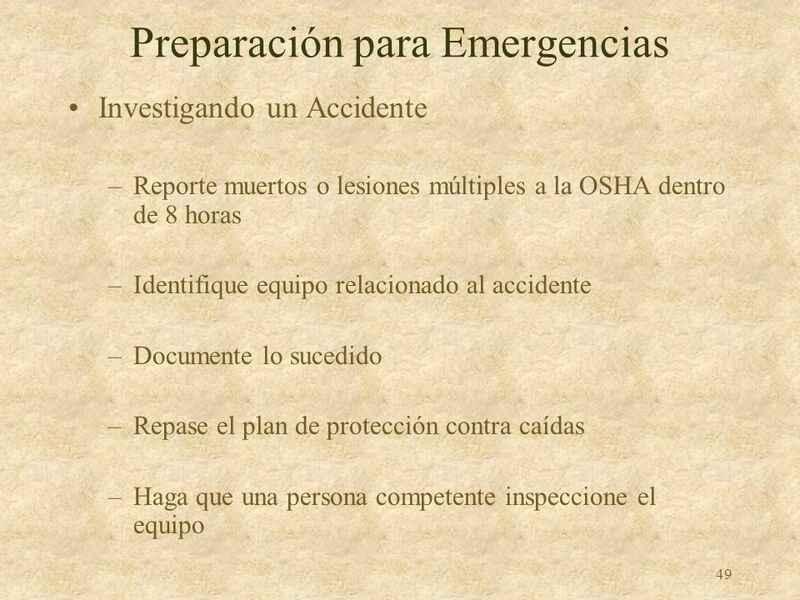 Report fatalities and multiple injuries to OSHA within eight hours. 2. Identify all equipment associated with the accident and put it out of service until the accident investigation is complete. 3. 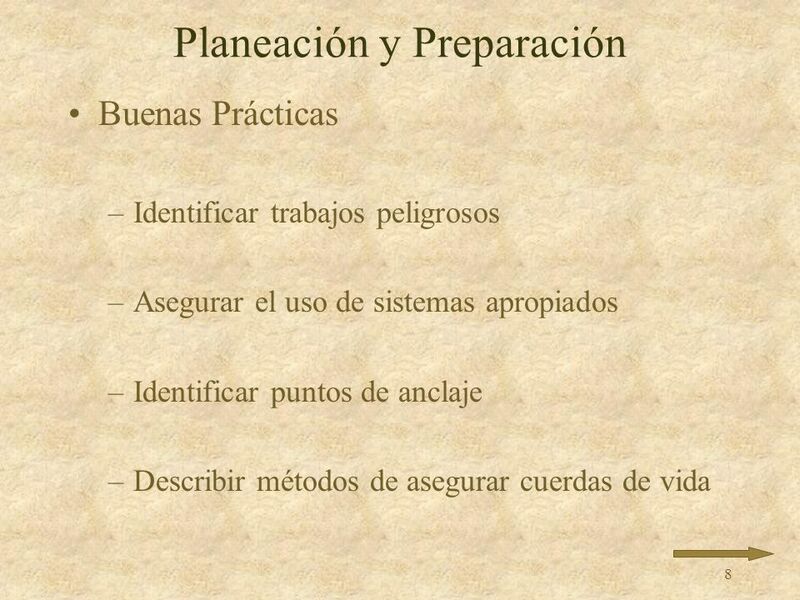 Document what went wrong, step by step. 4. Review the fall protection plan; determine how the plan could be changed to prevent similar accidents; revise the plan accordingly. 5. Have a competent person examine equipment associated with the accident; if damaged, repair or replace. If it contributed to the accident, determine how and why, and replace it. 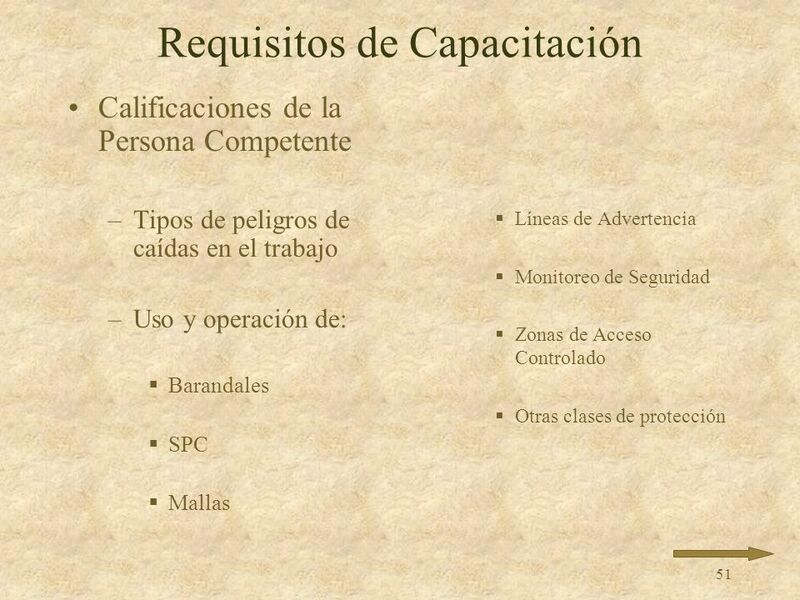 Una persona competente realiza la capacitación Training Requirements A. When it comes to fall protection, training is important and may well be the key to a successful fall protection system. According to subpart M, employers must provide a training program that teaches employees who might be exposed to fall hazards how to recognize such hazards and how to minimize them. 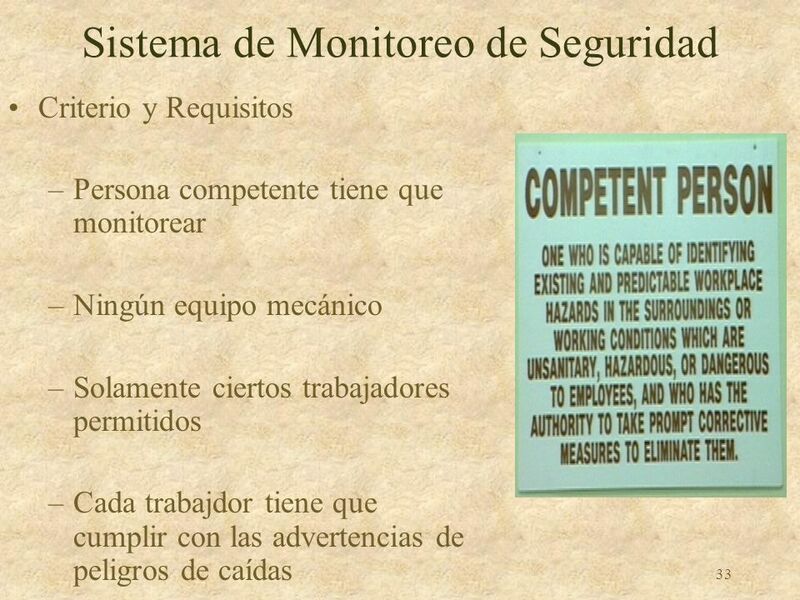 Employees must be trained by a competent person. 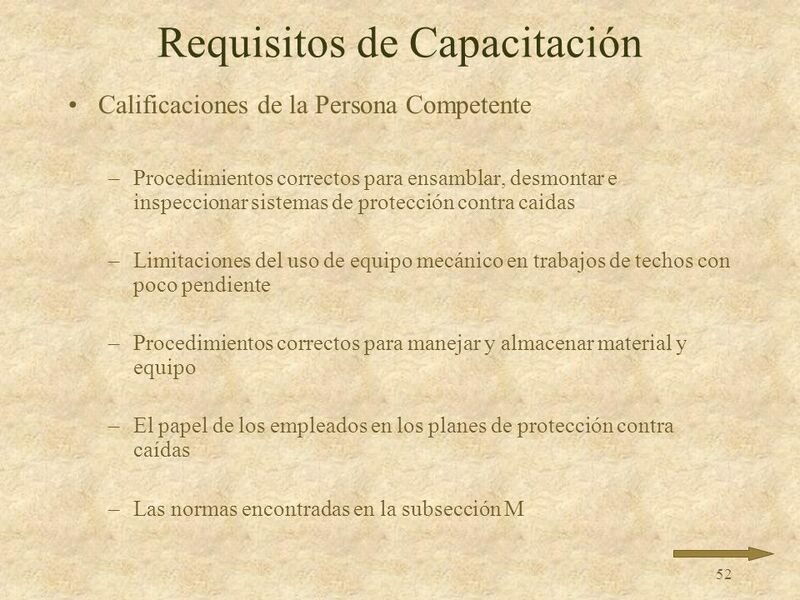 Calificaciones de la Persona Competente Procedimientos correctos para ensamblar, desmontar e inspeccionar sistemas de protección contra caidas Limitaciones del uso de equipo mecánico en trabajos de techos con poco pendiente Procedimientos correctos para manejar y almacenar material y equipo El papel de los empleados en los planes de protección contra caídas Las normas encontradas en la subsección M h. Correct procedures for erecting, disassembling and inspecting fall protection systems i. 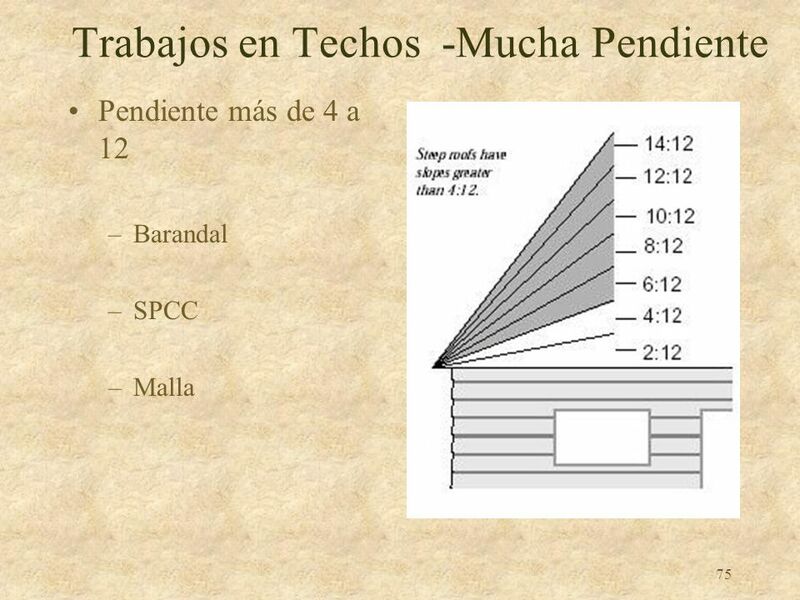 Limitations of use of mechanical equipment in low sloped roof work j. Correct procedures for handling & storage of material and equipment k. Role of employees in fall protection plans Standards contained in Subpart M Workers who use or intend to use a personal fall arrest system or positioning device system should also know: 1) How to wear the equipment; 2) The proper hook-up and attachment methods for the equipment; 3) Appropriate anchoring and tie-off techniques for their work; 4) How to estimate free-fall distances; 5) Inspection and storage procedures; and 6) Self-rescue procedures and techniques. 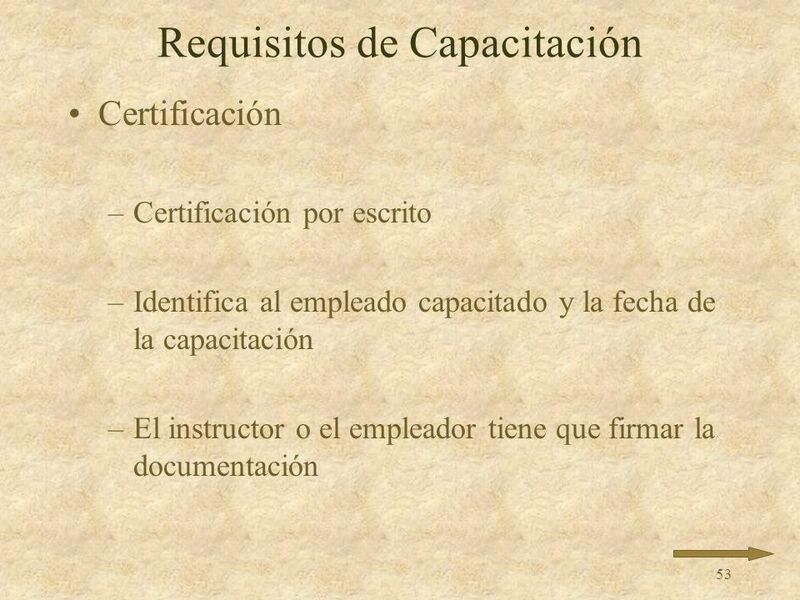 Certificación Certificación por escrito Identifica al empleado capacitado y la fecha de la capacitación El instructor o el empleador tiene que firmar la documentación C. Employers must prepare a written certification that identifies the name of the employee trained and the date of the training. The employer or the trainer must sign the record. 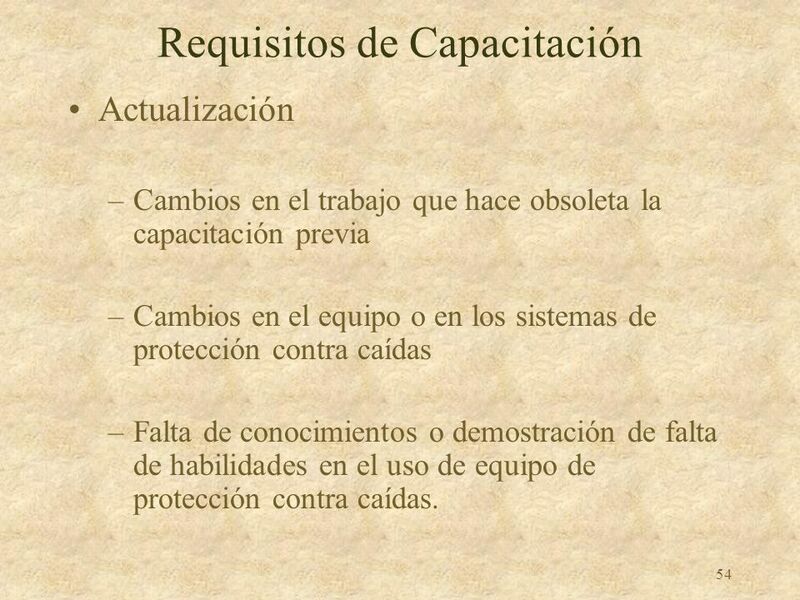 Actualización Cambios en el trabajo que hace obsoleta la capacitación previa Cambios en el equipo o en los sistemas de protección contra caídas Falta de conocimientos o demostración de falta de habilidades en el uso de equipo de protección contra caídas. D. Retraining must be provided when necessary. Examples of when retraining may be necessary: 1. 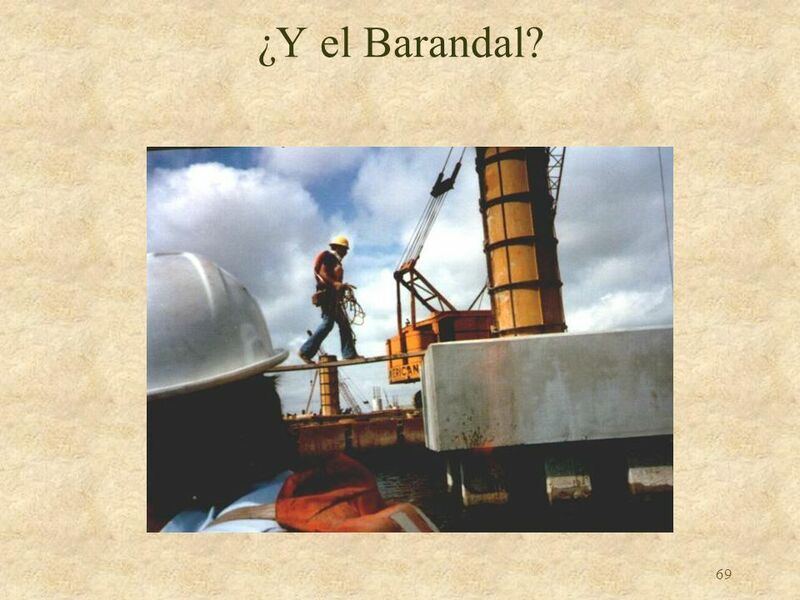 Changes at a worksite that make earlier training obsolete; 2. Changes in the type of fall protection equipment used by workers 3. 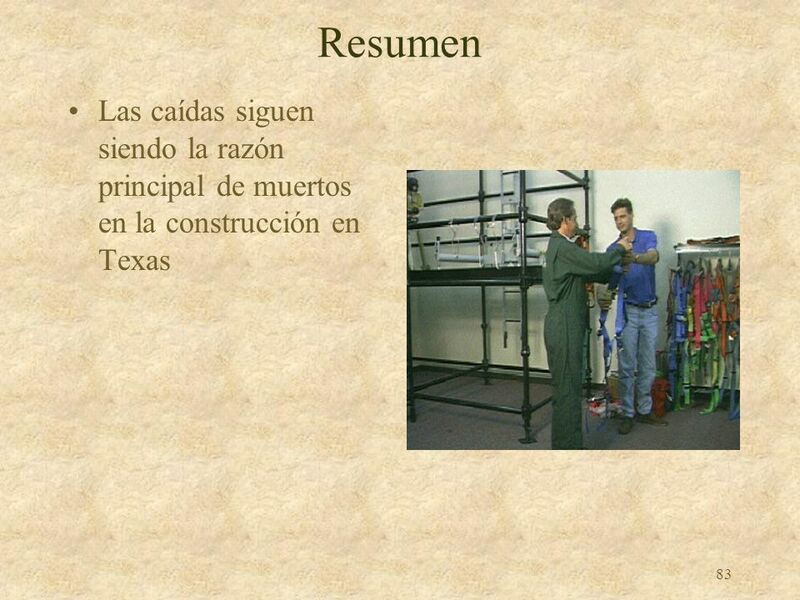 Failure to recognize worksite fall hazards; and 4. Failure to demonstrate skills for using fall protection equipment effectively. E. Training should be hands-on as much as possible, particularly with a personal fall arrest system. CFR states that before doing any work requiring use of personal protective equipment, employees must be trained to know when personal protective equipment is necessary; what type is necessary; how it is to be worn; and what its limitations are, as well as proper care, maintenance, useful life, and disposal. Personal fall arrest systems are considered personal protective equipment by OSHA. 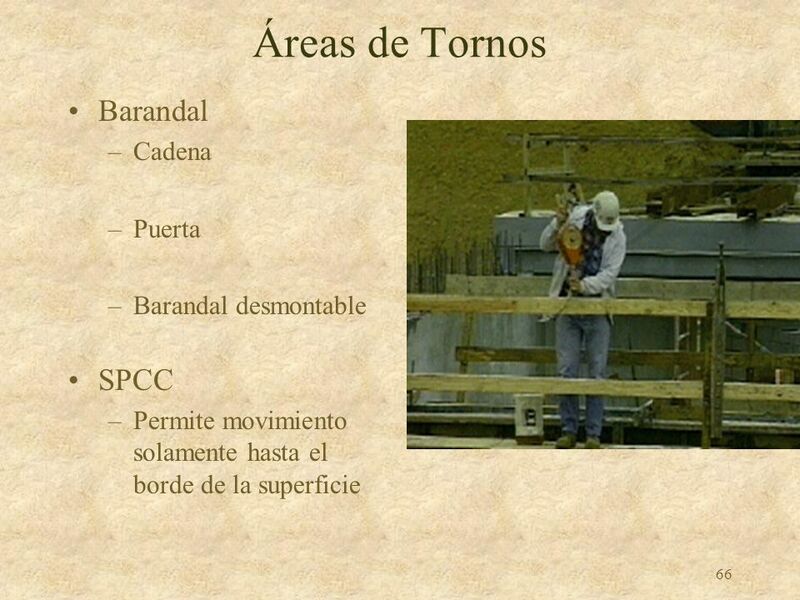 El borde de un piso, techo o armazón de un piso u otra superficie de caminar/trabajar que cambia de lugar al estar poniendo, formando o construyendo secciones adicionales. D. Leading Edges 1. Definition: the edge of a floor, roof, or formwork for a floor or other walking/working surface which changes location as additional floor, roof, decking, or formwork sections are placed, formed, or constructed. 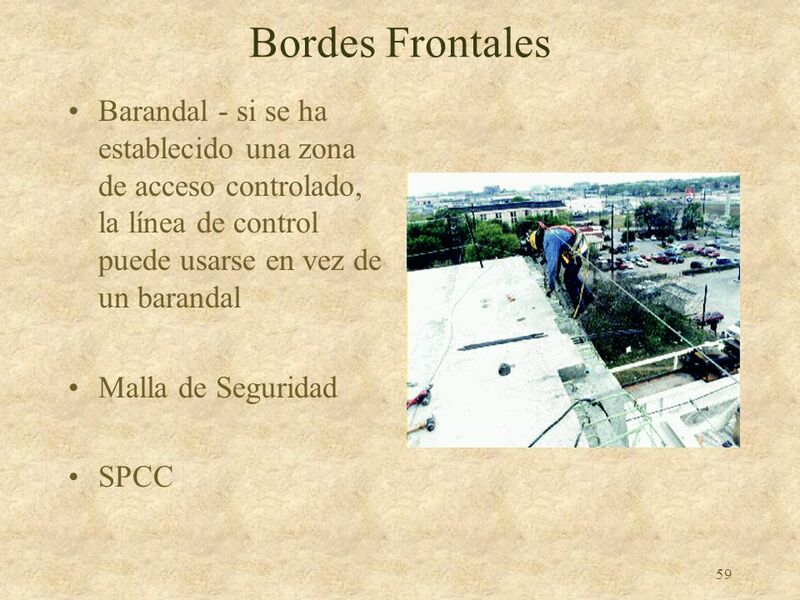 59 Bordes Frontales Barandal ‑ si se ha establecido una zona de acceso controlado, la línea de control puede usarse en vez de un barandal Malla de Seguridad SPCC 2. These areas must be protected by: a. guardrail system (if a controlled access zone has been established, the control line may be used in lieu of the guardrail) or b. safety net system or personal fall arrest system If not actually engaged in the leading edge construction but still in the area of the construction, an employee must be protected by the equipment above. 3. EXCEPTION: if an employer can establish that it is more appropriate to implement a system other than any of the above, then a fall protection plan in accordance with CFR (K) can be established. 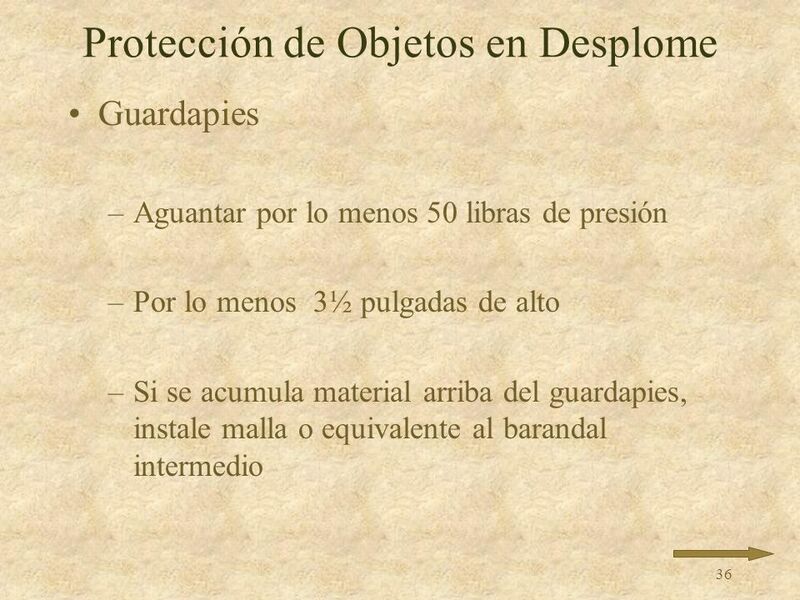 60 Hoyos Barandal Todos los lados y bordes no protegidos Para pasar material: máximo dos secciones desmontables Acceso –puerta o entrada desviada Un vacío o espacio, de 2 pulgadas o más, en un piso, techo u otra superficie de caminar y trabajar (incluyendo tragaluces). 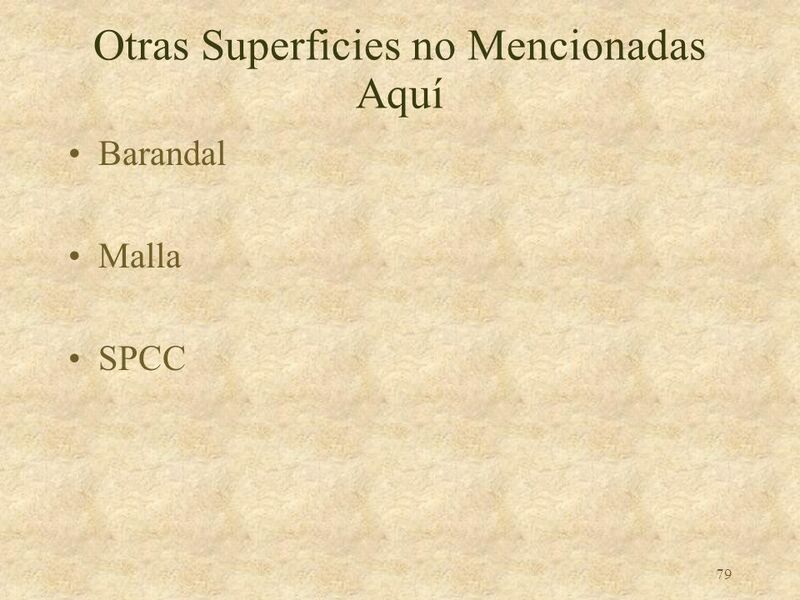 SPCC Tapa E. Holes 1. Definition: a void or gap 2 inches (5.1 centimeters) or more in the least dimension in a floor, roof, or other walking/working surface. 2. 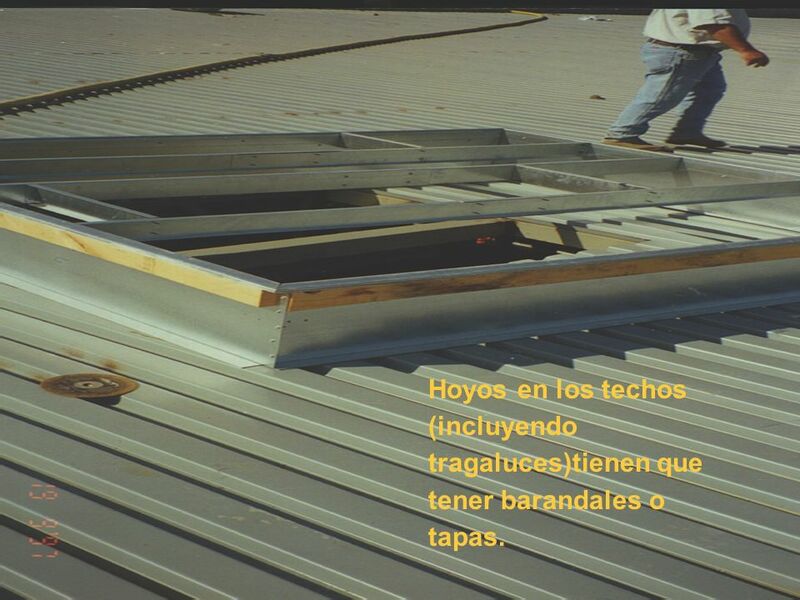 These areas (to include skylights) must be protected by: a. personal fall arrest system or b. cover or c. guardrail system - must guard workers from all unprotected sides and edges. If workers pass materials through the holes, no more than two sides of the guardrail can be removed. 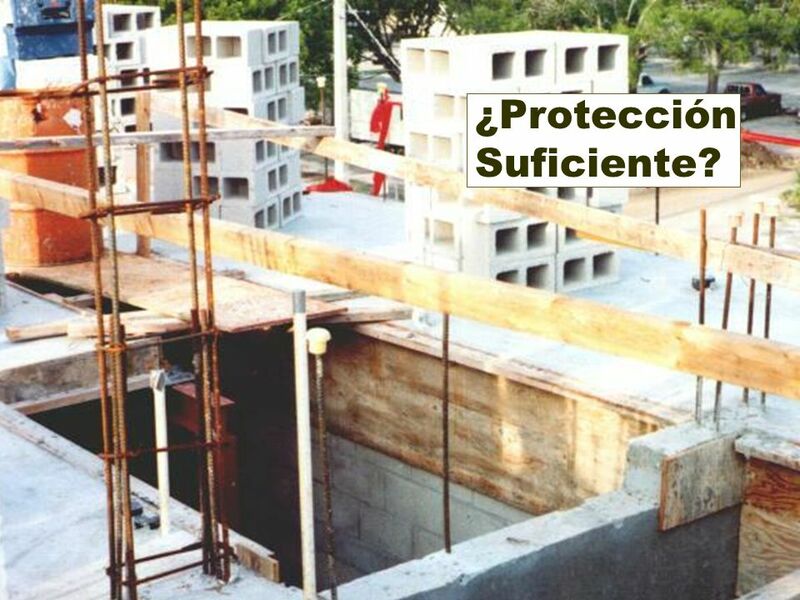 When materials are not passed through holes, the holes must be covered or guarded on all unprotected sides and edges. Holes used as access points must be offset or protected with a guardrail and a gate. Es muy fácil caerse en ellos al pisar hacia atrás o al estar cargando cosas que obstruyen la visibilidad. 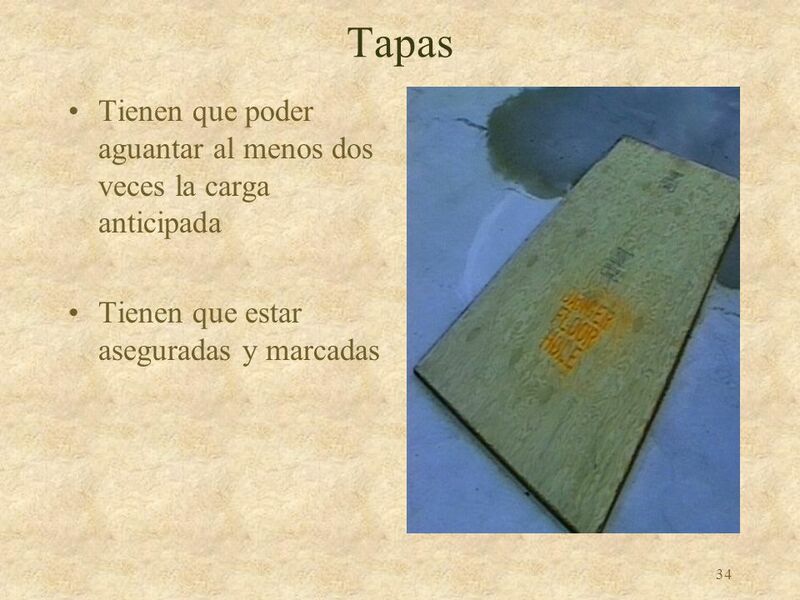 62 Hoyos en los techos (incluyendo tragaluces)tienen que tener barandales o tapas. 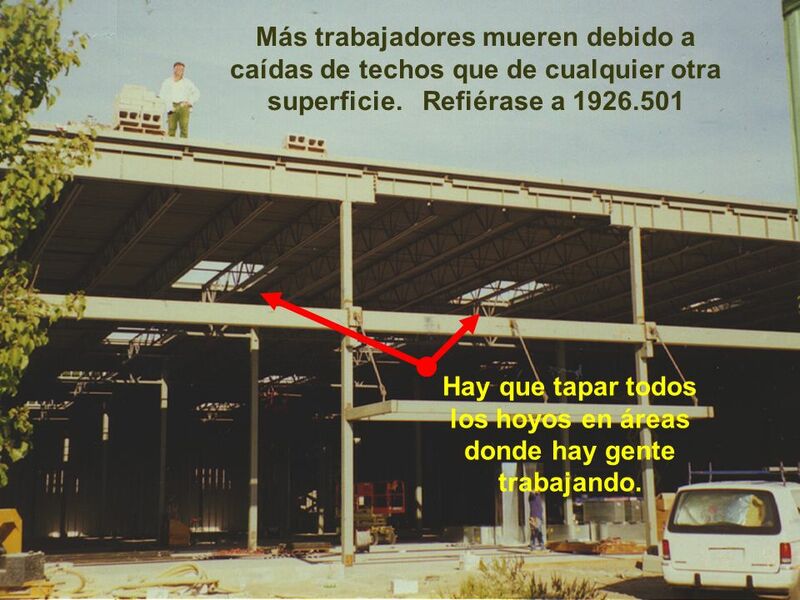 63 Hay que tapar todos los hoyos en áreas donde hay gente trabajando. 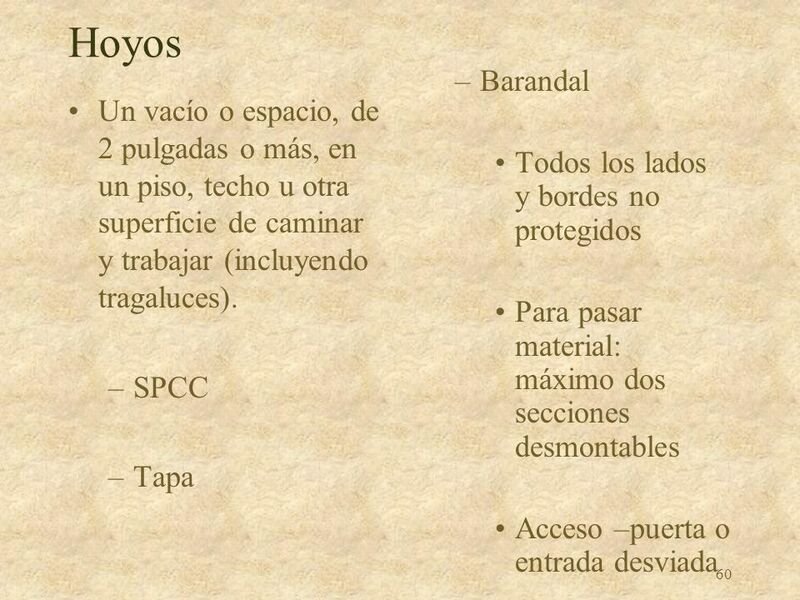 Más trabajadores mueren debido a caídas de techos que de cualquier otra superficie. 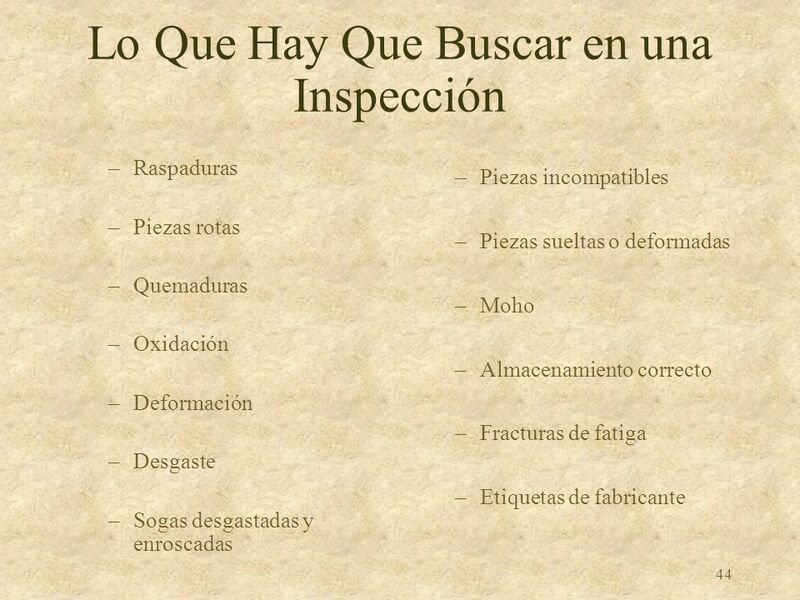 Refiérase a Hay que tapar todos los hoyos en áreas donde hay gente trabajando. 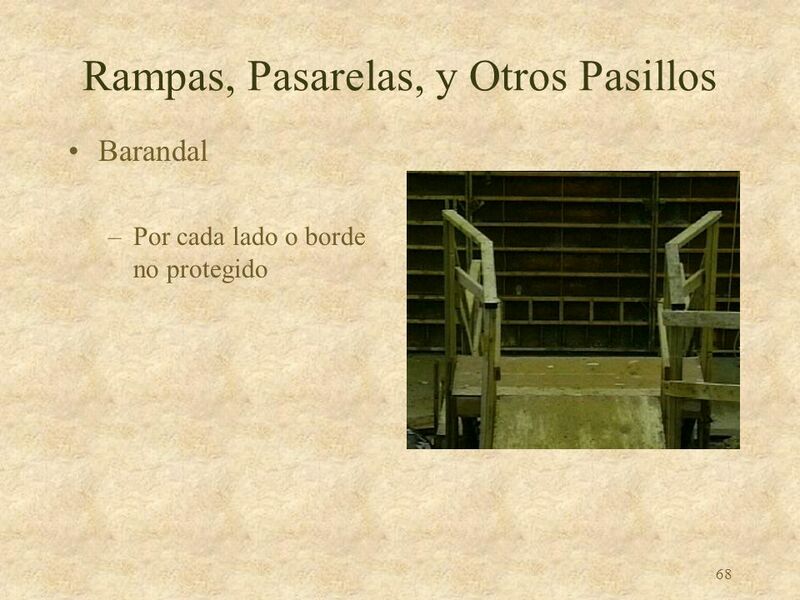 Barandal Por cada lado o borde no protegido H. Ramps, Runways, and Other Walkways 1. Guardrail systems used on ramps or runways must guard each unprotected side and edge of the ramp or runway. 1. These areas must be protected by: a. guardrail system or b. fences or c. barriers or d. covers 2. When walkways are provided to permit employees to cross over excavations, guardrails are required if the walkway is six (6) feet (1.8m) above the excavation. 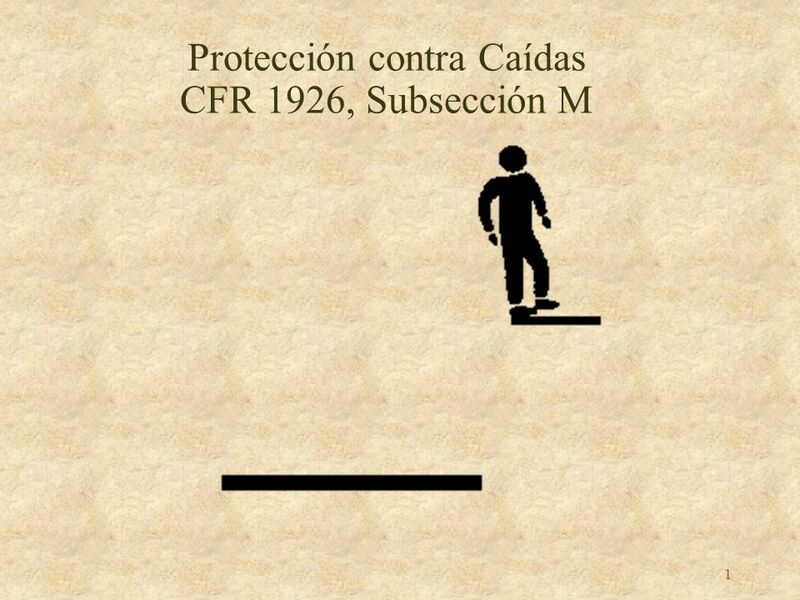 76 ¡PELIGRO! 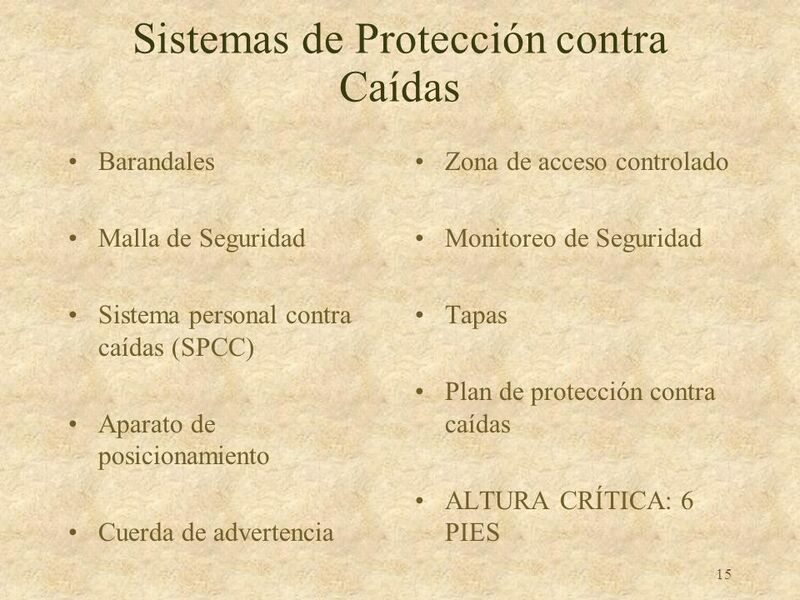 Ninguna Protección contra Caídas. 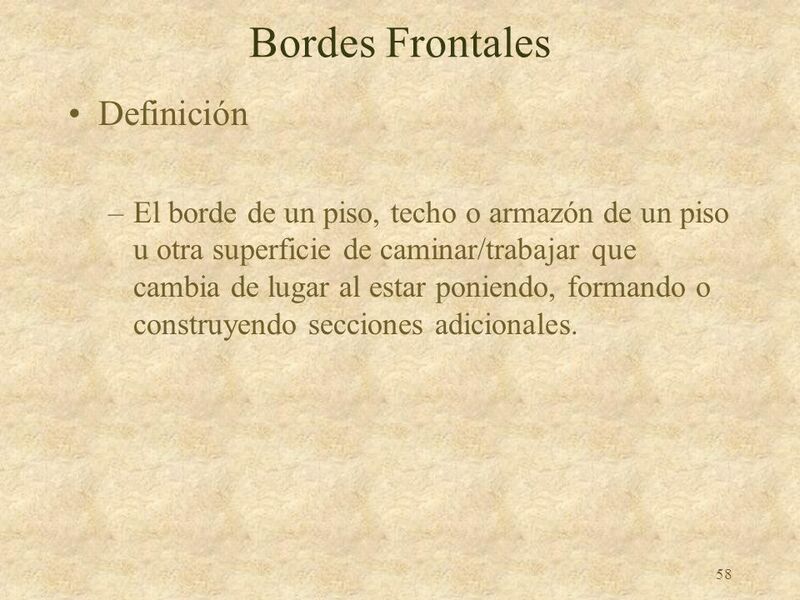 Entablonado no completo en el andamio. 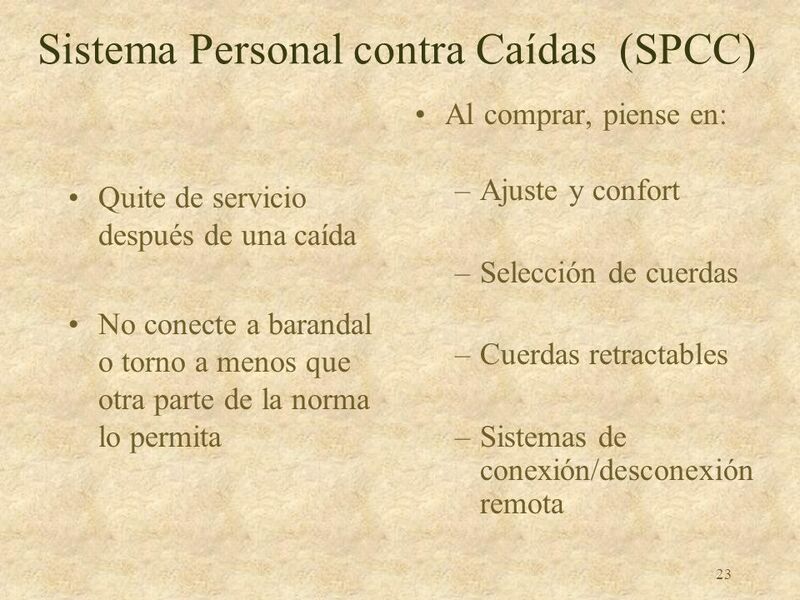 ¿Persona Competente? 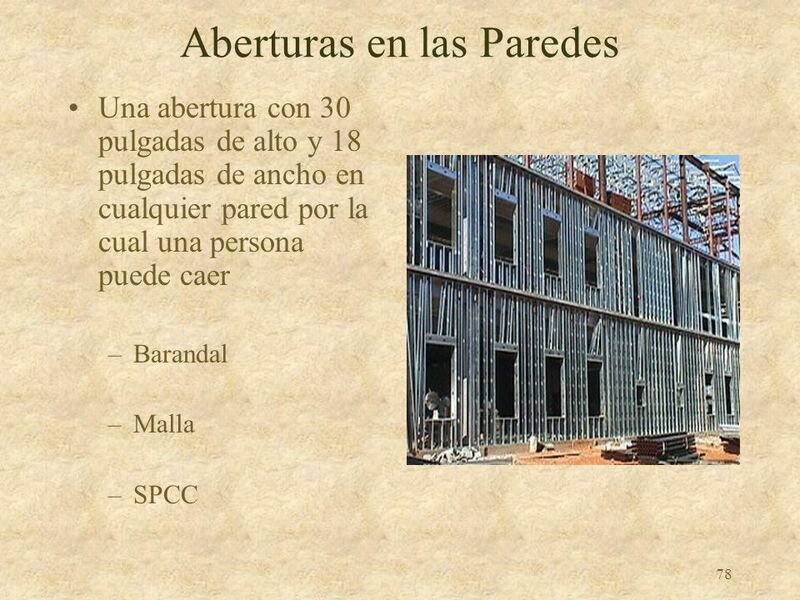 Barandal Malla, o SPCC N. Precast Concrete Erection – concrete members (such as walls, panels, slabs, columns or beams) that have been formed, cast and cured prior to final placement in a structure. 1. These areas must be protected by: a. guardrail systems or b. safety net systems or c. personal fall arrest systems 2. EXCEPTION: if an employer can establish that it is more appropriate to implement a system other than any of the above, then a fall protection plan in accordance with CFR (K) can be established. 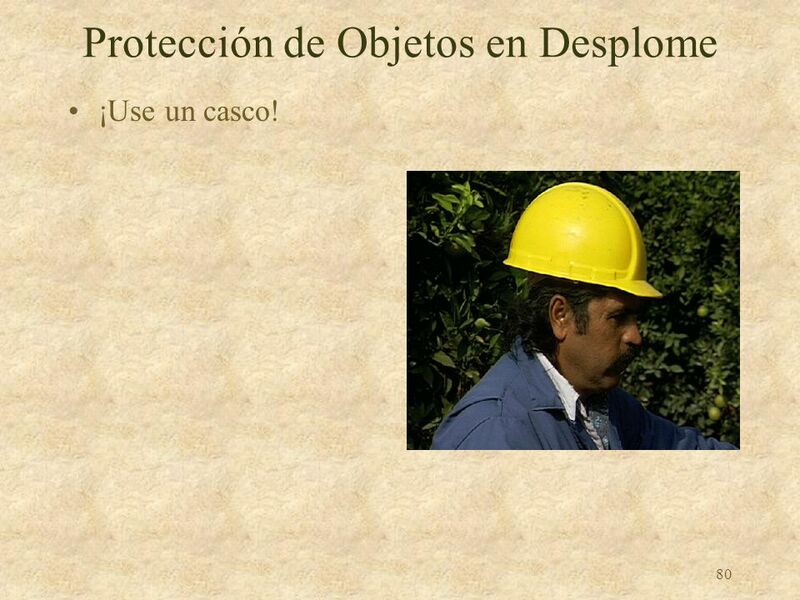 ¡Use un casco! Q. 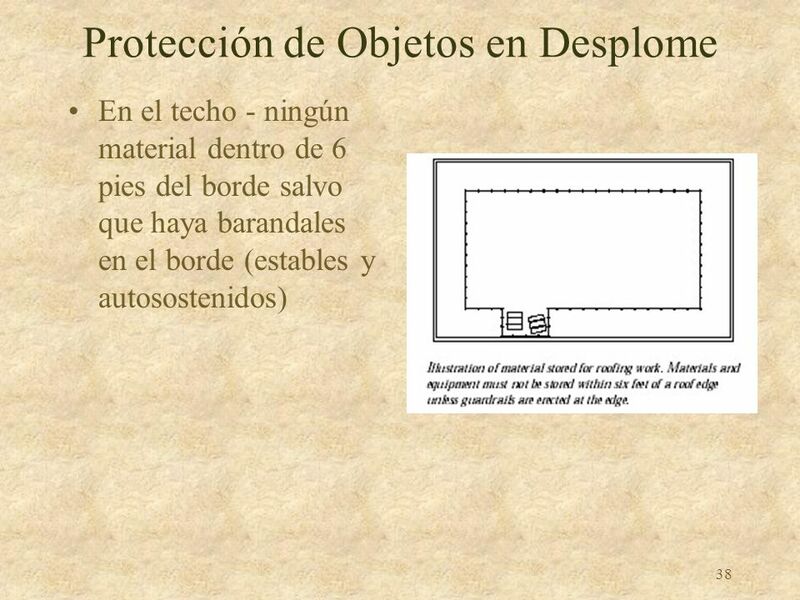 Protection From Falling Objects 1. When exposed to falling objects, an employee must wear a hard hat. 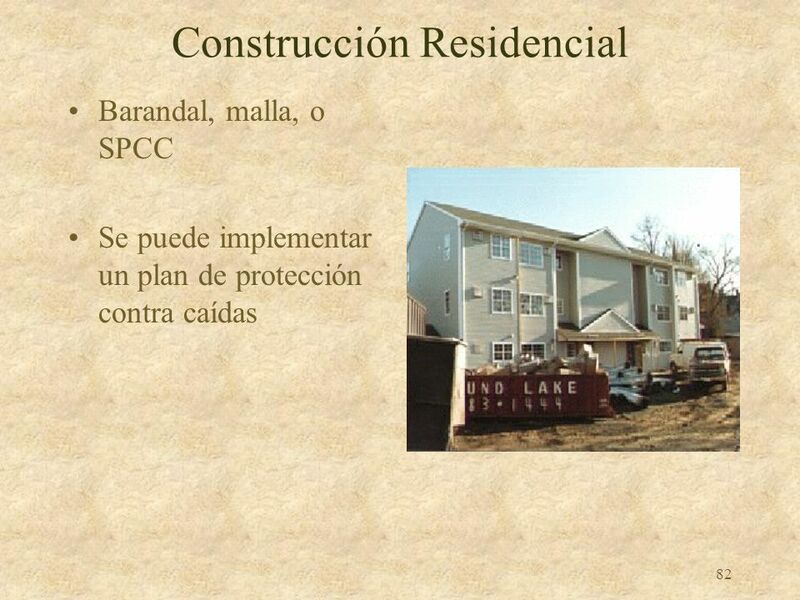 Barandal, malla, o SPCC Se puede implementar un plan de protección contra caídas R. Residential Construction – refer to OSHA Instruction STD 3-0.1A dated June 18, 1999. 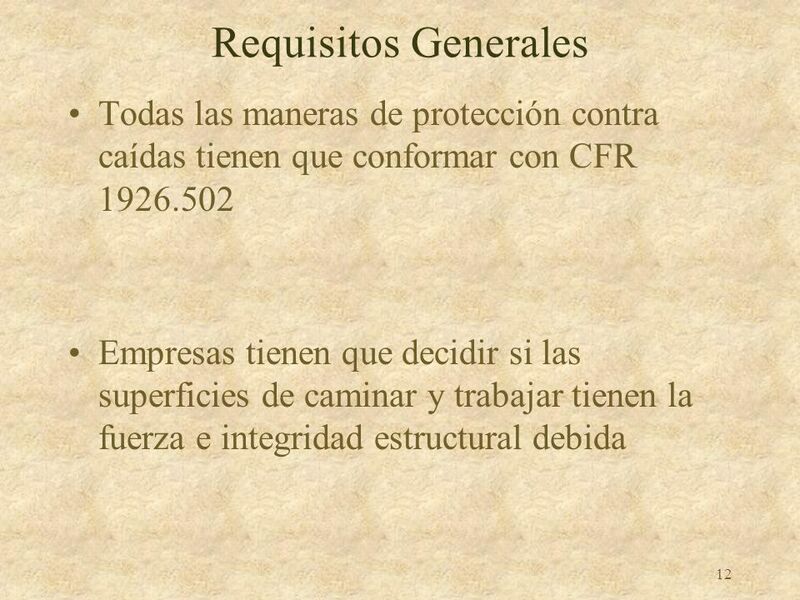 Descargar ppt "Protección contra Caídas CFR 1926, Subsección M"